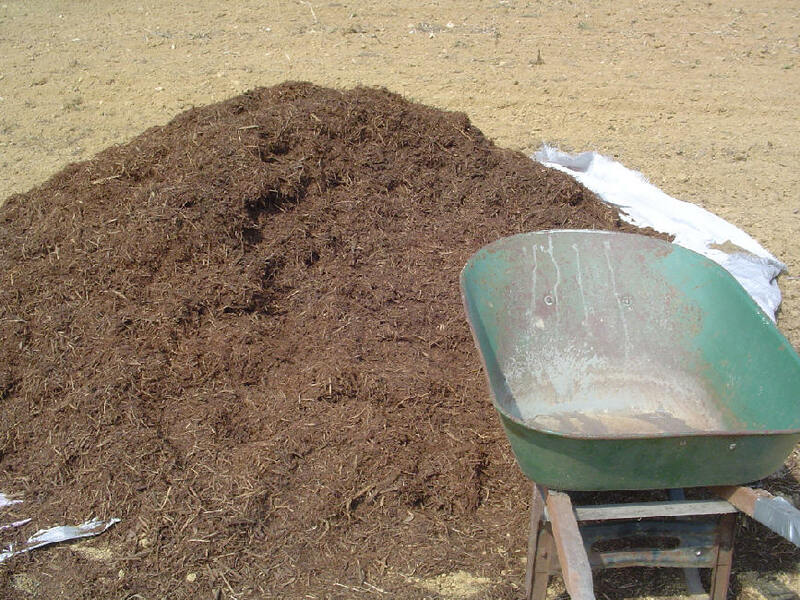 1:43 PM March Madness may be over, but Mulch Madness continues here at the farm. 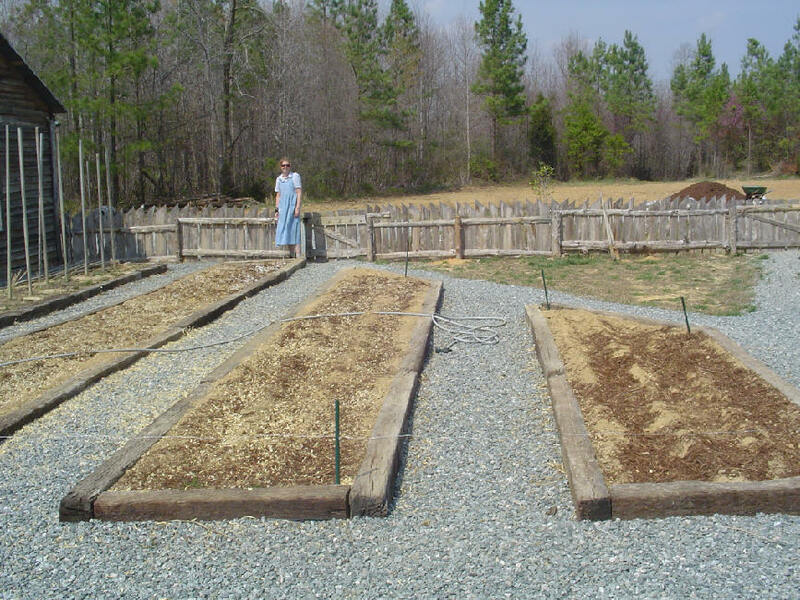 Becky Lynn's raised beds are planted in carrots, Brussels sprouts, leeks, beets, Swiss chard, onions, broccoli, and cabbage. The dogs were of absolutely no help at all. Say, is your ground as hard and dry as ours is? 1:40 PM A big Friday shout-out to our dear neighbors and friends Dr. and Mrs. Warren Turner. Thanks for your gift of eyeglasses for the Ethiopian people. They are greatly appreciated. 6:47 AM In our textual criticism class recently I presented the arguments in favor of the reading “without cause” in Matt. 5:22 – that is, Jesus is forbidding, not all anger (as in the NASB, NIV, etc. ), but only “causeless” (i.e., unrighteous) anger (as in the KJV, NKJV). I argued this in a Novum Testamentum essay back in 1988 (NovT 30  1-8). Our discussion inevitably led us to Paul’s injunction regarding anger in Eph. 4:26: “Be angry and sin not.” Rodney Decker discusses the exegetical options (.pdf) in interpreting this difficult verse. His conclusion may surprise you. 6:42 AM Read the Gospel of Mark in Greek uncial script. 6:37 AM Jim West defends self-publishing. He raises a good question: Does the quality of a book depend on its publisher? I haven’t yet self-published a book, but I am considering publishing online a 600-page research tool on Hebrews, comparing the style of the book with the Pauline letters. With Wenham's help, many students have taken the first step to serious study of the New Testament with surprising ease. That is a great compliment to any work. 6:30 AM I share the enthusiasm of Michael Bird that the Criswell Theological Review is up and running again. I remember the faculty of Criswell College discussing this when I taught a 2-week course for them a few years ago. I cut my scholarly eye-teeth writing book reviews for CTR and JETS back in the early 80s. The latest issue deals with the emerging church. 6:25 AM A good friend of ours is making "Gospel Bracelets" for Ethiopian women. Becky Lynn will give them to the ladies attending her women's class in Alaba in a few short weeks. 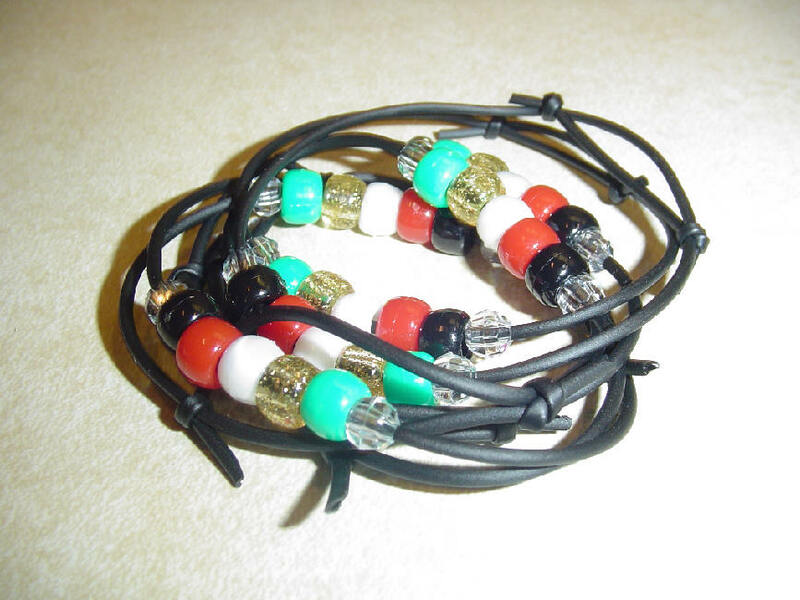 The bracelets have black, red, white, gold, and green beads – black for our sin, red for Christ's blood, white for His righteousness in us, gold for heaven, and green for the new life He has given us. We are asking our Ethiopian daughter Emebet to write a song about these colors in Amharic that Becky can teach to the ladies. 6:21 AM Briefly noted…. Only one more main speaker to line up for our conference on Mark 16:9-20. Deo volente, it will take place on our campus a year from now…. Nathan returns home tonight after being gone for a few days on a house renovation project. 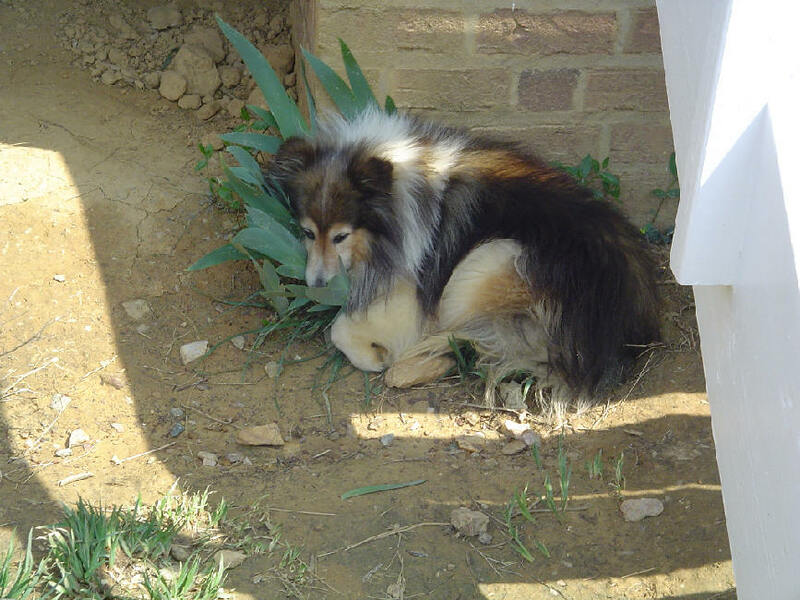 Farm work is much easier with him here…. Becky leaves for Dallas in 10 days and for Ethiopia in 7 weeks. What will I ever do without her? …. I’ve had several wonderful emails this week from people who are seeking God’s will for their lives vocationally. I too can remember the funnel being huge at the top, but I assure you it will gradually narrow until you are (fairly) certain about your giftedness and ministry…. It’s going to be nice weather today – the first really warm day since last fall. If I still surfed I’d be boogying down to the beach. 6:16 AM This seems like a good way for a church to practice the Lord’s Supper. Please read to the very end of the article to see what benefits there are in connecting the Supper to a full meal. 6:13 AM Joel Turtel reminds us why our children deserve better than public schools. 6:10 AM As anyone who has been there can attest, Ethiopia is a very complex nation. Clickhere to read the details of the growing political volatility in this ancient country in the Horn of Africa. 5:44 AM Trinity International University in Deerfield, IL, is seeking a chair for its Christian Ministries Department. 5:41 AM These churches become event-based organizations that measure their success based on their ability to draw larger and larger crowds. Christians who are part of these kinds of churches tend to approach their faith as very compartmentalized. They attend events at their church just like they attend other events in their life. The design of these events often makes Christians feel good about their faith, but they rarely produce life-change. They walk away with warm feelings about themselves or God, but they do not mature into disciple-making followers of Jesus Christ. Read more. I found your site while I was looking around on the internet. I typed in 'New American Revolution' on a google search and I got a link to one of your articles. After reading a few articles I'd have to say that I agree with a lot of your ideas. So, I wonder if you could help me out. The reason I did the search was because I'm trying to find a group of people that support the idea of going back to the way America was in its founding. When the government protected the rights of its citizens and God was who we trusted. I figure you have been around a lot longer than me and you might know of some group or party that supports this. I'm fed up with the major political parties and politicians leading this country down the path of self-destruction. If I could find this group then I might be able to turn my ideas into action or at least offer them aid. Anyone can criticise, I want to make solutions. So if you know of this group I seek, please let me know. Thanks. Thank you, Jason, for your very kind letter. The Lord Jesus offers a Declaration of Independence to every slave of sin. When we become His captives we are set free. As a follower of the Lord Jesus Christ, I would encourage you to set your eyes, not on any earthly political party, but on the One who spared not His own Son so that we could enjoy freedom from sin and from all the evils that would enslave us. I share your frustration with both of our major political parties, and personally I believe a lot of good is being accomplished by the Constitution Party to restore America to her biblical and constitutional foundations. But our real problem is not political, as you know. It is that our churches have become, like the Laodiceans, lukewarm. The average Christian today demands a comfortable 72 degrees when our Lord bade us to come to a boil. May God deliver us from a comfortable 72! 1) See the excellent discussion of the Complutensian Polyglot at the Ricoblog. 2) Here’s a great photo of its title page. 3) Christian Theological Seminary has an original. 5:30 AM Greek students! Here’s a verb quiz you can take online. 5:40 AM I've got to hand it to my wife -- she is trying really hard to learn some Amharic before returning to Ethiopia. Now that's one difficult language. But people so appreciate your efforts to speak their language. My problem was this: as soon as had I learned some Amharic phrases we would travel to a region that spoke another language (such as Burginya). So I'd master a few phrases in that tongue only to find myself the next day in an area that spoke Alabinya. Eventually I gave up on the regional dialects. But I must admit that Amharic is a fascinating language, even though it requires you to learn a mind-boggling alphabet. 5:35 AM Looks like there's flooding in my home town of Kailua, Hawaii. We got some rain every day but only rarely would it flood. My prayers are with you. 5:32 AM Now this is an interesting question: How common was Koine Greek in the first century? 5:27 AM A mosque for Athens? 5:25 AM Just ran across this new linguistic term: phonestheme. 5:22 AM For one Dutchman, this sure beats digging wells in Ethiopia. 5:19 AM I note that Sacra Pagina has published an extensive review of our Using New Testament Greek in Ministry. Thank you, whoever you are. 5:13 AM Did Erasmus know better than to include the "Heavenly Witnesses" passage of 1 John 5:7-8 in his Greek New Testament? 5:10 AM Over the last few years and at my direction, you've spent hundreds of hours of 'learning' French. What a (relative) waste of time that was! Please accept my sincere apology. Read A public apology to my first two daughters. 5:06 AM What do the Greek word for "baptism" and the following picture have in common? 5:03 AM Wow, things around here are truly unbelievable. 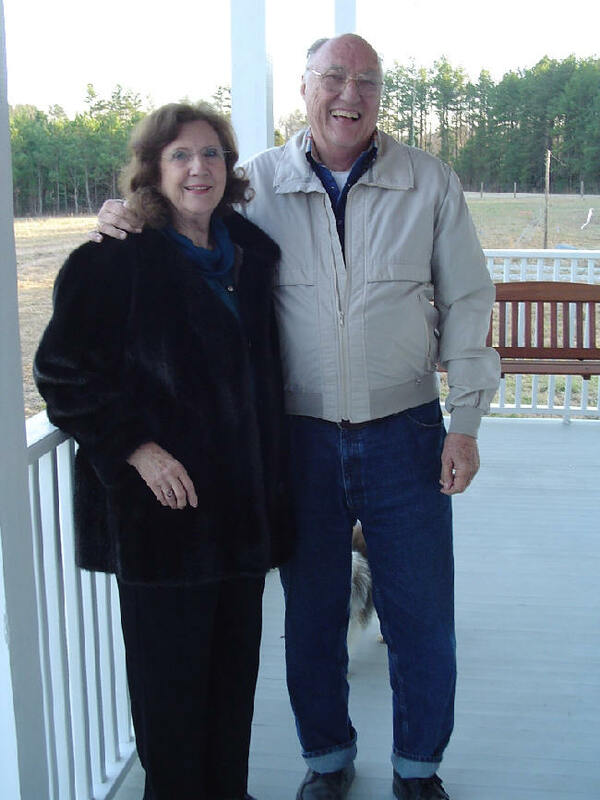 Becky and I have been invited to speak at yet another church group in the neighboring state of North Carolina. I love visiting with missions-minded people who often support missionaries they've never met but who are eager to put a "face" on missions. Meanwhile, religious persecution in many parts of the world heats up, not least in Ethiopia, but believers continue to refuse to bow, in any way, to the religious-secular powers of their countries. All of this is paving the way, I'm afraid, to our own country where believers will find themselves an embattled minority of tiny proportions, especially if they speak out against the cherished views of the majority. The predictions described in 1984 and Brave New World have come to pass, and more and more the church is becoming subject to the control of the state. I sure am glad for the great doctrine of the sovereignty of God. 4:57 AM Yesterday our textual criticism class had a great time discussing the variant in Mark 6:20 (the choice is between Herod “was greatly perplexed” at what John the Baptist said, or Herod “did many things” John told him to do). Our discussion included my New Testament Studies essay called “The Text of Mark 6.20” (NTS 34  141-45). We also examined the comments by Metzger in his Textual Commentary and William Lane in his commentary on Mark. In my own research prior to class I noticed that one essay assumed that “did many things” is not original, and that the NET Bible concluded this reading was nonsensical. Our class decided, by a count of 15 to 3, that “did many things” was more likely to be original than “was greatly perplexed” and that it made perfectly good sense in its context. Not that I demand that everybody agree with my views on the text. Far from it. I well remember some of my seminary courses in which we were never free to express ourselves openly. But just as the Christian life is one of freedom -- life with God is never a shotgun wedding -- so in religious education the option to choose freely must be there for genuine learning to take place. When I was in school the unexpressed axiom seemed to be: the student, no matter how knowledgeable, cannot be trusted to make the right decision. He had to be told what to think, what to value. Conformity was more desired than free commitment. All this is anathema to me. Christian education is -- or ought to be -- threatening. The student can say No. All teaching involves taking this risk, but the individual must have the opportunity to choose. My students are told and told clearly: You go wherever the evidence takes you. Just be sure you are able to defend your views. 4:50 AM Here’s an interesting comparison of Bible translations. How does yours fare? 6:18 AM Check out the Assembling of the Church website if you haven't done so already. This site promises to provide a wealth of information on the New Testament church. 6:15 AM A bit of farm news. 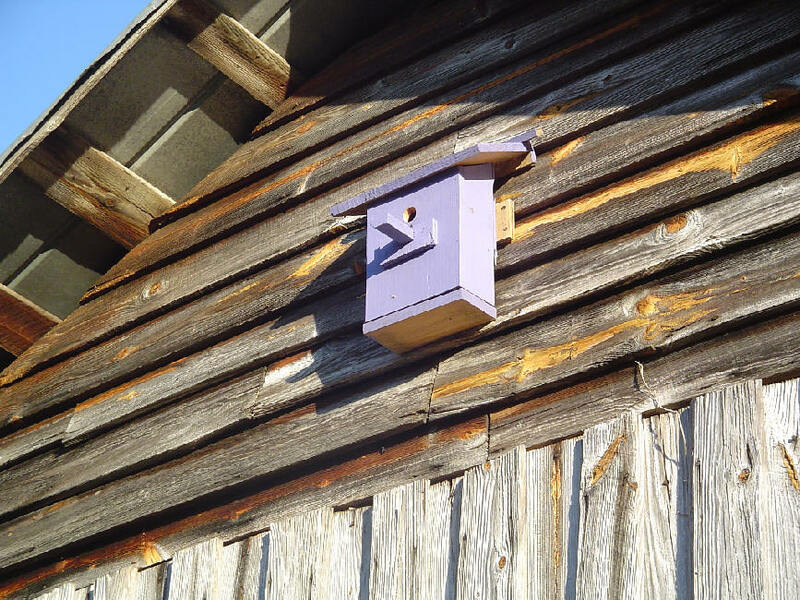 The bat houses have been hung, including these on the wood shed. 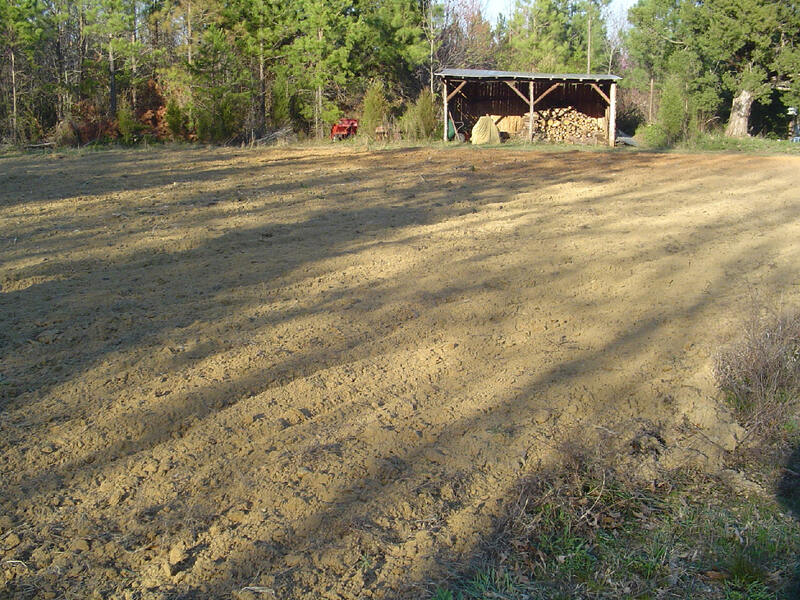 We've also begun disking our fields in preparation for planting. The big secret: What crops will we be sowing this year? Stay tuned. And here's one of our many bird houses -- or bird "mansions," as Nathan calls them. I'll admit they are spacious. 6:10 AM Yesterday Becky and I had a great time just being together and chilling out after a very busy weekend. I cleaned my musket while she took care of our reenacting clothes, then off we went to South Boston, stopping first for some Mexican food and then picking up chicken feed. In both the restaurant and feed store I had a chance to practice my (terrible) Spanish. The big news of the day: We received a check for $4,500 from Union Chapel Baptist Church, where we spoke a couple of weeks ago. This is the precise amount to fund the building of two meeting houses in Alaba. When Becky and I opened the letter we were dumbfounded. We literally do not have the words to express our thanks to God and these wonderful saints. The funds will be deposited in a bank account in Ethiopia and, under the careful supervision of the Alaba church elders, will be spent on building materials. National Christians will provide the labor. I'm wondering: Will any of these buildings be completed when Becky and her parents visit Alaba in two months? What a thrill that would be. 6:05 AM Good friend George Lansing sent along a link to his sons' new website. It's devoted to helping youth understand basic Christian doctrine and opposing world views, and includes specific "how to" articles and a well monitored discussion board. Visit Turning the Tide Online. 6:00 AM Have you ever been to Glorietta, New Mexico? 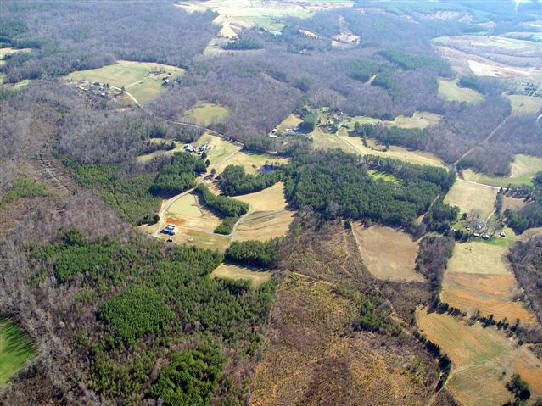 Did you know that a significant Civil War battle took place there 144 years ago today (see photo below)? The Battle of Glorietta Pass was a Union victory and put an end to the Confederacy's attempt to control the western mines. 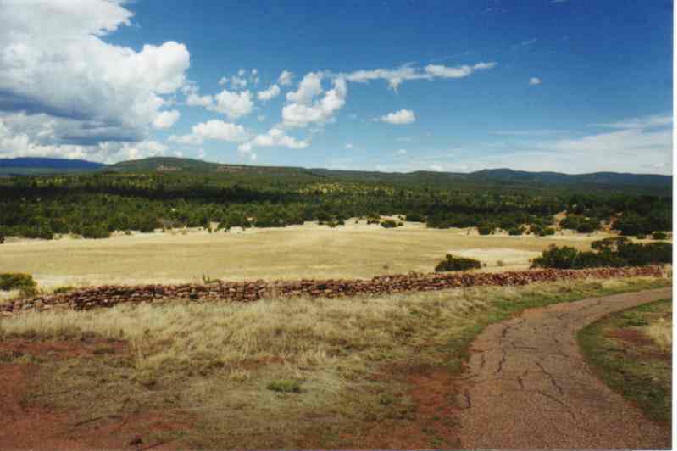 On your next trip through New Mexico why not stop by and see the battlefield as we did on a family vacation several years ago? 10:59 AM A big Monday shout-out to our friends at Liberty Christian Church in Henderson, NC, where we presented our Ethiopian ministry last night. I was asked several times during the fellowship hour that followed why we do what we do. I emphasized that our "going" to people is not conditioned by their response to us but by their need and God's love for them. Becky Lynn and I are coming more and more to recognize that we have to give people our lives. Whatever the nature of our ministry -- Bible teaching, leadership training, evangelism in the far distant villages -- basically what people want and need is our lives. All of us are "priests" and it is our lives that we are to offer to God as spiritual sacrifices in behalf of a needy world (1 Pet. 2:5). Gradually Becky and I have come to realize that people are seeking from us involvement -- a meshing of our lives with their lives. Because we are followers of Christ, we announce to the world that we believe Christ is the answer. So we give our lives, first to God, and then to people. We tell the world that we believe God's ways and God's teachings are always right and best. We see that our basic calling in life is to be witnesses to God in the ordinary, everyday relationships of life. That is what the Gospel is all about. God calls us to be a people who are willing to care and care deeply, who are willing to love and love unconditionally. Thus Becky and I seek to use our God-given resources through special missions in and to the world. Currently our focus is on the neglected and persecuted Ethiopians. These people need to feel that they are not isolated and alone. They need to have a feeling that they are part of a larger fellowship -- not only accepted by the church in America but also encouraged and supported by that church. Thus we seek to follow God's leading as to how we can best show concern to these people as persons -- not simply as objects of evangelism or teaching. In a nutshell, our ministry is one of linking the love of God -- and linking the churches in America -- with the churches in Ethiopia. Thank you, Liberty Christian, for your participation in the Gospel. Your contribution will fund one-tenth of a meeting hall in the persecuted province of Alaba. God will not be so unfaithful as to forget your labor of love. 10:40 AM At the Latta reenactment I purchased They Went into the Fight Cheering! by Walt Hilderman. 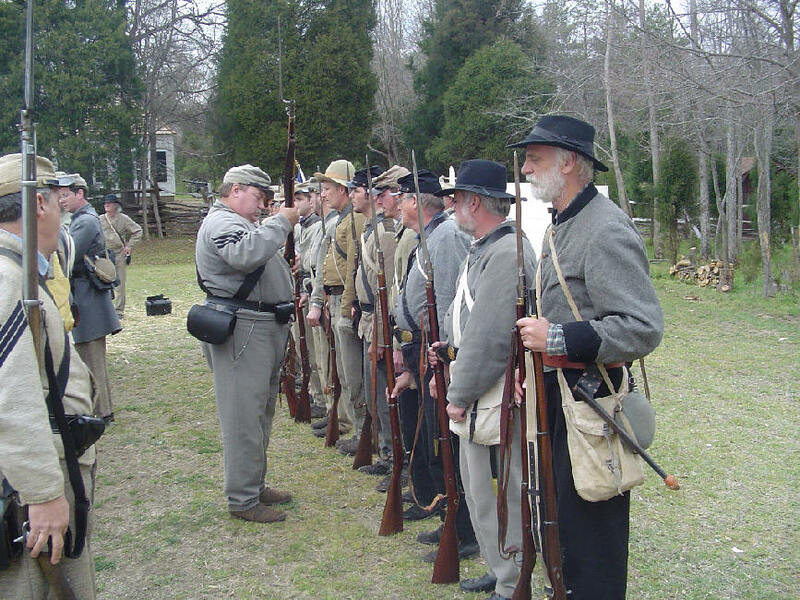 It is the story of compulsory military conscription in North Carolina during the Civil War. Walt's great-great-grandfather was one such conscript, and his letters provided Walt with a rich source of information on the war. 10:34 AM The Battle of Sample Farm on Saturday and Sunday was a huge success. It was fun sleeping on the ground again, though the weather was bitter cold -- our water was frozen solid every morning. I estimate over 300 reenactors were in attendance. In addition to fighting on Saturday (I was killed early on), we toured the Latta Plantation home, built in 1800. The house was owned by the Sample family during the war, and four of their sons fought at the great Battle of Gettysburg in 1863. All four miraculously survived both the battle and the war. On Sunday I preached a message called "The Gospel according to Tamar, Rahab, Ruth, and Bathsheba." Nathan and I accompanied the singing on our guitar and gut-bucket, and Nathan played our 1850 reed organ as we sang Robert E. Lee's favorite hymn. Many thousands of troops came to faith in Christ during the war, and it is our desire to see as many of our fellow reenactors enjoy the "full" experience of what it meant to be a soldier during the war. Below: Becky Lynn prepares a delicious breakfast of farm-fresh eggs and bacon. The beautiful Latta House is in the background. Inspection arms! Private Black is on the right. Our worthy opponents, who have just arrived at the Latta House. Most of these guys are my good buddies from the 30th North Carolina Troops. I "died" when about 10 of them aimed right at me. Can you believe they did that to me? Reenacting is a fun hobby. It's also a great mission field. You meet people from every conceivable walk of life, and many of them are facing difficult life circumstances. 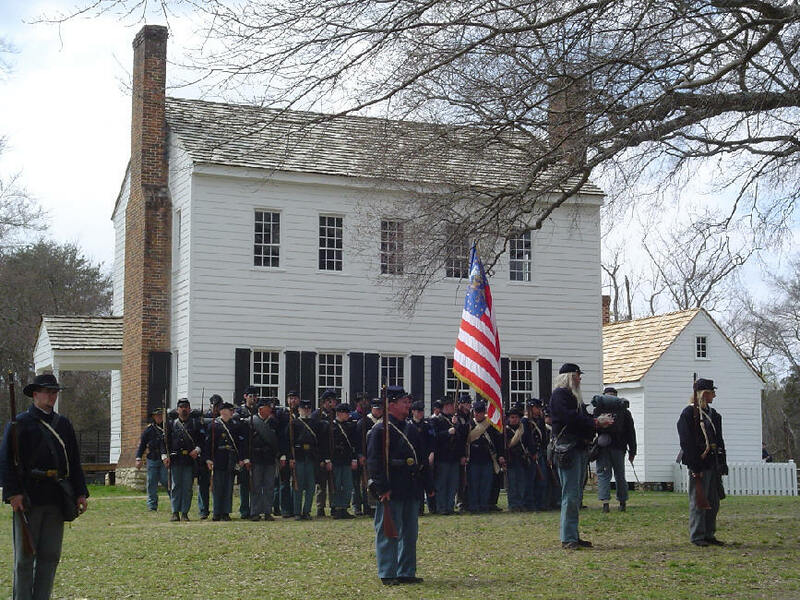 Reenacting is also a good way to learn American history -- its many nooks and crannies, its oddities, and, perhaps above all, its testimony to the folly and hubris of man. 6:13 AM Grace Theological Seminary in Winona Lake, Indiana, announces a position in New Testament. 6:10 AM Jerry Lassetter sent along this interesting link to Harry Potter, Ancient Greek style. 6:05 AM A shepherd sent in this response to our essay The One Table of the Lord. He has given me permission to share it with you. I think it will bless and challenge you, as it did me. Thank you for your brief exposition and application from 1 Corinthians 11. I am serving as an elder/pastor in a small church (a church plant with 6 families). I had pastored full-time for nearly 17 years before trying to start a church that hopefully comes much closer to the NT patterns of church practice. I had become convinced that the age-segregation and music (contemporary vs. traditional) segregation so entrenched in the church were "dividing" the body of Christ. 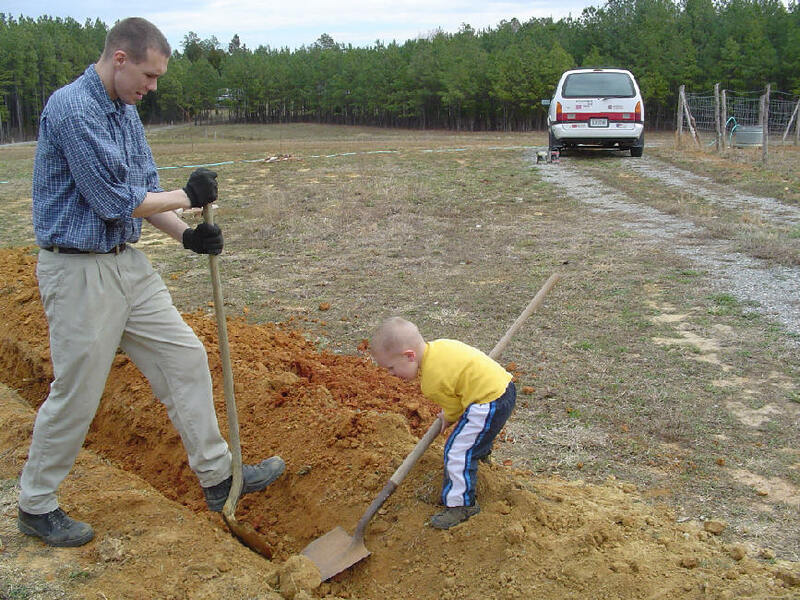 In our church I am encouraging fathers to take the spiritual lead in their families, and I labor to provide them weekly discipleship resources that encourage them to "shepherd" their families. In our weekly meeting of the church the children are present and participate with us. It is a joy. 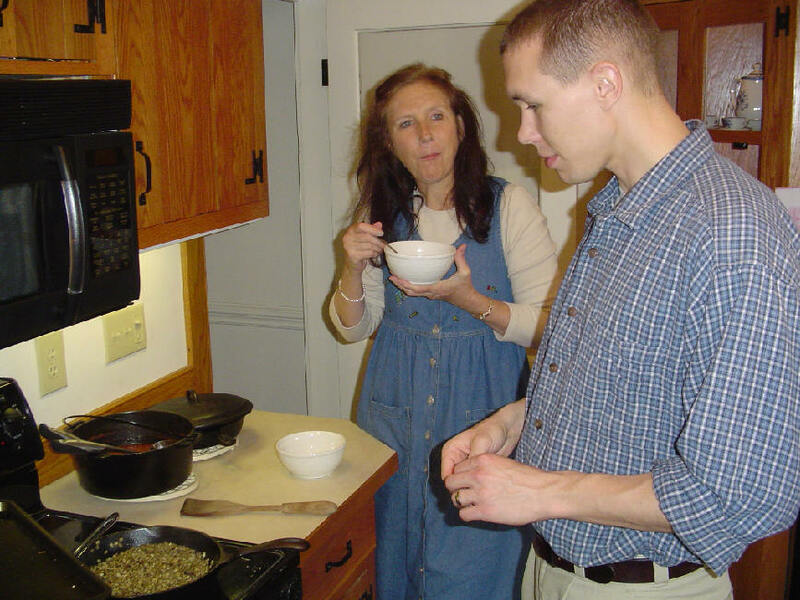 In an effort to teach this truth of a father's spiritual responsibility and to teach that there is no "privileged" priesthood who alone may serve the table (in our Protestant churches this "unwritten priesthood" becomes the pastor and or deacons or elders), I have had the father's serve the Lord's Table to their family members. Your article convicted me that this communion practice is not biblical. The effort to teach the fathers spiritual responsibility and to teach the priesthood of the saints is biblical, but to make the point through the serving of the Lord's table is not. Unwittingly I have perpetuated the Corinthian error, but repent of this sin and seek God's grace to make this right. Interestingly, I too have been for the past three weeks reading and studying 1 Corinthians in my devotions (Wow! Talk about a NT book that is written to the American Evangelical Church!). Your thoughts on 1 Corinthians 11 deeply challenged me. We read your article as a family at breakfast this morning and had a very Spirit-filled discussion on this communion issue as it relates to our church and the larger issues of NT balance in the development of a NT church. You have challenged me to rethink "orthopraxy" in relation to orthodoxy. I was leading the church to participate in a practice that runs counter to the precious theology of the church as the body of Christ--One Body! I do not wish to do anything hurtful to the Church of our dear LORD and Savior, so I will continue to pray and search the Scriptures that I might rightly handle the Word of Truth and rightly lead this church family to practices consistent with the precious truths of God's Word. I wish that I could sit a spell with you and pick your heart and mind on how to develop a NT church, but through your web blog and articles I am to a certain extent able to do this. Thank you for your ministry. Thank you, again for your timely challenge on 1 Corinthians 11. On another note, I continue to use your Ethiopia reports, printing one segment per-week for our church people to read and pray about. This week we are reading report 5b. These reports have encouraged our hearts for the cause of world missions. I am praying (with a little leading from me) that our fellowship will consider an offering to minister to the needs in Ethiopia. We are privileged to participate with you in the cause of the gospel. Thank you and may the Lord richly bless you and your dear wife. 6:00 AM Chuck Baldwin sinks a three-pointer with this essay on the so-called Religious Right. 5:53 AM Lee Duigon shows how Christian paganism is alive and well in America. You may have seen some of this before, but Lee’s essay is an intellectual armory against such nonsense. 5:50 AM Over at Slice of Time, Jeremy O’Clair has an update on the scholarly reaction to Bart Ehrman’s Misquoting Jesus. Two issues of likely interest to readers of DBO come slamming together in this column – the history of the transmission of the New Testament text, and the value (or lack thereof) of the Byzantine text. Having read my friend Dan Wallace’s great interview over at Evangelical Textual Criticism, I guess that leaves yours truly as the only Sturzian left on the planet. But all that aside, I urge you to hit the links button in Jeremy’s essay and connect yourself to some great reading. 5:43 AM What Pieter Friedrich learned – and didn’t learn – from his college history class. 5:42 AM Here’s an interesting online Latin tutorial. Of course, I still think homeschoolers should learn ancient Greek instead and kill two stones with one bird. 6:17 AM Yesterday I was asked which New Testament lexicon I would recommend to students. It’s the one by Bauer. 6:15 AM My colleague Andreas Köstenberger just told me about his revamped website. I think the day is coming when every professor will have his or her website and blog. Mamye, let me give you a prayer request. Recently the evil one is fighting with H. M. In addition of last times challenges last week his daughter, whom you gave money to hospital is died. In the ceremony of funeral all his relatives refused to involve in it. But some of Alaba town church members went and present in the ceremony. Please pray so that God would comfort him in this bad situation. How Becky and I wish we could have been there to attend the funeral. God bless those Ethiopians who are standing for the Gospel even when it means dreadful maltreatment. Let’s pray for their persecutors. 6:07 AM In case you don’t understand, here’s one reason why our “war on terror” is a bad idea. I noted earlier this year that on your blog you linked my short paper on cremation last fall. I just presented the annual lecture series at Detroit Baptist Seminary on this topic and have posted on my web a much enlarged discussion of the issue (same basic conclusion). Description and link atwww.NTResources.com and direct link to the pdf document is http://faculty.bbc.edu/rdecker/documents/CremationLecturesHO5.pdf. Students, check out Rod’s site if you haven’t already. It’s one of the most informative on the web. 5:58 AM In response to several inquiries, yes we butcher our own cows right here at the farm, and no we don’t buy meat from the store any more. We figure it costs us a dollar a pound to raise our own hormone-free cattle from birth to freezer. Similar beef would cost us at least five or six dollars in the stores. And nothing beats the taste. 5:52 AM Northwest Christian College in Eugene, Oregon, is seeking to fill a position in Bible and Christian Ministry. 5:50 AM I’ve been asked to teach a course this summer at Midwestern Baptist Theological Seminary in Kansas City, MO. The dates will be July 17-21, and the course will be New Testament Survey II (Acts - Revelation). I’ll have some time for sightseeing, so if you live near KC and would like to recommend some places to visit, I would love to hear from you. 5:46 AM “For years, conservatives have complained about what they saw as the liberal tilt of federal grant money. Taxpayer funds went to abortion rights groups such as Planned Parenthood to promote birth control, and groups closely aligned with the AFL-CIO got Labor Department grants to run worker-training programs. Read more about the pilfering of the U.S. Treasury by “conservatives.” The solution, of course, is private charity – e.g., supporting pregnancy support services, as our family does. 5:40 AM You can now get a daily dose of Rick Warren for the cost of a MacDonald’s burger. And to think that Becky and I could buy a Bible for an Ethiopian child for the same amount of money. What are some advantages and pitfalls of evangelical views concerning scripture? I am not an expert on evangelical views concerning scripture, but I would say that one of the pitfalls is most clearly illustrated in the way that Robert Gundry was treated several years ago by the Evangelical Theology Society. As I understand it (and I am subject to correction here if I have got it wrong), he was expelled from the society because of his views on Matthean literary creativity. What I find depressing about that is that the arguments are not engaged on their merits (and the merits are considerable) but on whether or not they fit with a creedal affirmation about what Scripture is thought to be like. I would find it hard myself to engage in scholarship where I was constantly worrying about how it measured up against a prior affirmation about inerrancy or the like. FWIW, the problem many of us inerrantists had with Gundry’s commentary on Matthew was fundamentally a hermeneutical one, not a theological one. Gundry assumed (as do many redaction critics) that Matthew skewed the historical account (of the Magi, for example) to advance his own theological agenda. Gundry also assumed that what is theological is not historical. These are, of course, huge assumptions and they deserved a response. Several members tried to address these issues and to refute Gundry’s view that Haggadic Midrash was an acceptable literary genre among Christians of the first century. Thus, while the doctrine of inerrancy was certainly involved in the debate over Gundry’s commentary, hermeneutical issues were not ignored. We should also recall that ETS, unlike SBL and AAR, has a doctrinal basis. So it has every right to debate whether the views of its members are compatible or incompatible with its doctrinal basis. ETS was formed to allow scholars who held to biblical inerrancy a forum for the exchange of ideas. As a member of both ETS andSNTS I realize that these forums are very different in their purpose and membership. But both, it seems to me, are legitimate forums, and each has the right to define its membership. I hope that clarifies things a bit, Mark. If I haven’t said it publicly before, welcome to North Carolina. I am glad you are here. 5:30 AM Here’s a provocative text-critical complaint. Question for Greek students: Do you think the English translation is accurate? If not, got a better one? photo of the opening verses of Vaticanus, where you can easily see how a scribe added the disputed words in the margin (you’ll need to scroll down a bit). Amazing what you can find on the web these days. 5:59 AM The latest addition to our home page is called The One Table of the Lord. 5:54 AM Almost forgot: Special thanks to our friends at Raleigh Chinese Christian Church for inviting us to speak there last Sunday. We also enjoyed the great Chinese food after the service. By the way, this coming Sunday they are interviewing a pastor for their English-speaking congregation. 5:53 AM Now I've seen everything -- a Bible in Pig Latin. Oodness-gay! 5:50 AM A year ago I lost my first horse to cancer. Funny, it seems just like yesterday that I was riding Cody. Re-reading the tribute I wrote a year ago brought back a flood of memories. (In case you didn't know, I am a pretty fanatical horseman. I would rather ride than drive a car any day.) 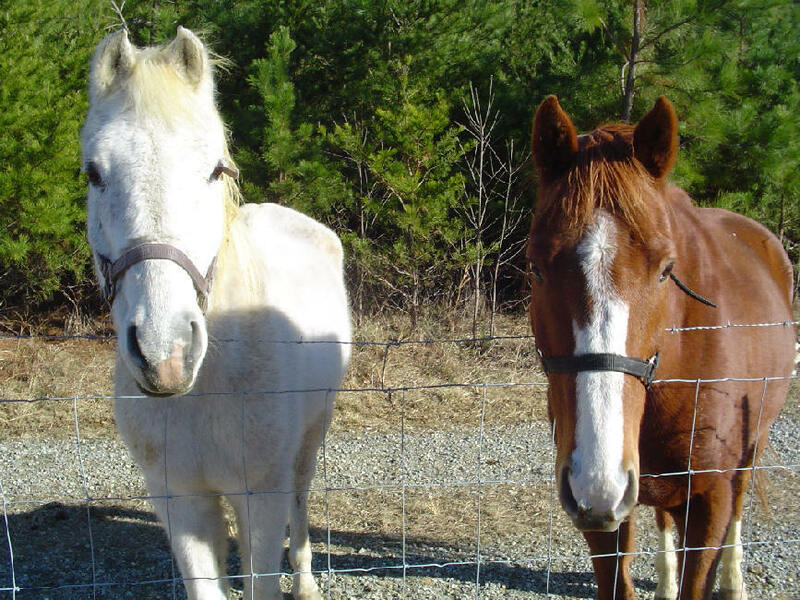 Below: Cody (left) and Traveler. 1) The Sterling Nobility of Robert E. Lee, which explains why the General was so well-loved by the people of his time -- both north and south. 2) Stonewall Jackson: The Man, the Story, the Legend, which is a volume for everyone interested in Jackson's Christianity, not just his generalship. 5:40 AM In my private devotions I am reading through 1 Corinthians in the Greek. I am struck by Paul's passion both for people and for the truth, in perfect balance, or so it seems to me. Needless to say, I would do well to strive for a similar balance between orthodoxy and orthopraxy. I can tell you one thing: I have a renewed love for Paul's Corinthian letters. 5:36 AM We had one of favorite meals last night for supper -- liver and onions, with Jasmine rice. I mention this because all my life I hated liver and onions and had never even heard of Jasmine rice. How our tastes change as we "mature." Thanks, honey, for a superb meal. 4:35 PM We just finished with our cow Alphie. We started at 7:00 this morning. The weather was ideal -- cool and crisp. We had lots of help, too, and I want to thank our good buddy Doug Cutts and his friends Curtis and Adam for their assistance. Matthew Rondeau also stopped by to lend a helping hand. I'd say we got about 300 pounds of farm-fresh, pasture-fed beef into our freezers today -- tenderloins, flank steaks, ribs, backstraps, roasts, and plenty of ground round. 6:47 PM I just got back from Richmond. Our class considered, among other topics, the debate over the authorship of Hebrews (was it Paul, Barnabas, Apollos, or who?). We had some great discussions, but the quote of the weekend goes to David. Referring to Heb. 1:1 in the Greek, he said that the letter just had to be Paul's because not once, not twice, but three times "Paul" is explicitly mentioned in the opening ("polumeros," "polutropos," and "palai"). We all enjoyed a big laugh over that one. I also taught them the Greek alphabet and the Greek alphabet song. We enjoyed the great lunch Becky had prepared beforehand. A collection was taken for Ethiopia, and a total of $159 was raised. By the way, the traffic in Richmond was horrendous. The hotels in the city were jam packed with soccer kids and their parents for a big competition this weekend. All the children I saw in my hotel were very well-behaved, though -- kudos to their moms and dads. If you sent an email in the past 36 hours, please give me a day or two to respond. Right now I'm too tired to do anything but relax. Have a great Lord's Day! 10:31 AM Just back from a long ride. Sad news: Trav and I stumbled upon the remains of our last turkey. Only his feathers were left. Must have been a fox that got him. That's the risk you take when you free-range your poultry. On an upbeat note, Becky Lynn has the kitchen sizzling. She's making BBQ beef, potato salad, and dessert for tomorrow's lunch in Richmond. I plan to leave at noon today. 8:49 AM I had a great meeting with our seminary president yesterday and he has given me the green light to organize a major conference on New Testament textual criticism for April of 2007. The topic: "The Last Twelve Verses of Mark: Authentic Or Not?" I plan to have 4 major presenters (both pro and con) and one respondent. A 90-minute panel discussion will follow. More details as soon as I have confirmed the speakers. This conference will be a follow-up to the symposium we had on our campus in April of 2000, when Eldon Jay Epp, Michael Holmes, Moisés Silva, Keith Elliott, and Maurice Robinson re-opened the TC can of worms. 8:43 AM Signs of the times: When I mentioned the name Francis Schaeffer to a group of students recently, they had no idea whom I was talking about. I still think his book The Church at the End of the Twentieth Century is one of the top 100 English-language books of the past century. We got our PLAIN TALK in the mail today and are currently listening to your interview...wow, that is great! I'm sitting here saying: "amen, amen, amen..." Thanks for the great testimony and encouragement. 8:35 AM This Sunday Becky and I will be back at the Raleigh Chinese Christian Church to share about our mission work and to meet up with many old friends. The church is comprised mostly of Chinese (both Mandarin and Cantonese speakers) with a good sprinkling of Anglos (including my alter-ego, a Mr. White). Growing up in Hawaii I had many Chinese friends, as well as friends from the Japanese, Portuguese, Philippino, and Korean communities. I grew up using chop sticks and eating Kim chi, and I think I would rather eat Korean food than American. One of the elders at RCCC knows this and often surprises me with a small jar of Kim chi whenever I come to Raleigh. When he does, I am always happy to share its contents with anyone who likes spicy, fermented cabbage. 8:28 AM What in the world did the church do before youth ministry? The author’s theology appears to be your strongest case. It is difficult to explain the addition of the phrase if it was not in the original. It was sufficiently shown to be the geographically widespread reading, being accounted for by both the Byzantine and Western text types. The style is not a problem as some propose. Most valuable is the internal evidence – the argument that Johannine Christology presents the highest Christology in the NT. Next up for debate: Matt. 5:22 -- did Jesus forbid all anger or only "causeless" anger? We'll use my Novum Testamentum essay as a platform for discussion. Should be fun. 8:19 AM Should unbelievers be invited to partake of the Lord’s Supper? Apparently so. 6:55 AM Much cooler weather is predicted for next week, which is good news since we need to "take care of" another beef cow here at the farm. 6:52 AM Greek students! Matthew Rondeau has published his initial research on the textual variant in John 12:28 at his website. I think he raises some important epistemological questions. 6:49 AM I'll be on the road again this weekend, traveling to Richmond to teach my New Testament Introduction class. Becky will stay behind this time and get caught up on various projects related to her up-coming trip to Ethiopia. Don't worry, students: I'll still bring lunch, though it will be simpler fare than you're used to. While I'm in Richmond I may swing by theMOC and see the new exhibit on the Confederate Navy. 6:45 AM Cool pix of some big waves in Hawaii. 6:43 AM Chip Bayer explains why Americans know so little about the U.S. Constitution. 6:42 AM Yesterday we wrapped up our meetings at Union Chapel Baptist Church. It's exciting to see God answer prayer in ways we weren't expecting. More than anything, I sensed a renewed commitment to follow the Word of God rather than the words of men. Nothing cheers a teacher like knowing that people are passionate about putting the Bible over Christian CDs, BBN, conferences, seminars, and even revival speakers. Incidentally, they talked Becky and me into singing our first ever duet. We sang "For God So Loved the World" and "His Name Is Wonderful." I enjoyed it, but I think I'll stick with teaching. On a completely different note, each night they served the most wonderful southern cooking you can imagine, although one time it seems that someone forgot to bring the fried chicken. The joke was: We need to cancel our supper; you can't have a Baptist meeting without fried chicken. I'm sure glad they had southern fried chicken. It's what we're going to eat in heaven someday. 6:38 AM Thursday shout-out to Mr. Alan Knox, who will be starting doctoral studies with me in the fall. He hopes to study the purpose of the meeting of the church in early Christianity. 6:35 AM This week in textual criticism we discussed the significant Christological variant in John 3:13. I argued for the inclusion of the words "who is in heaven" based on the external and internal evidence. At the conclusion of yesterday's class I asked each student to rate my argument on a scale of 1 to 10 (10 meaning "absolutely convinced" that the longer reading is original, and 1 meaning "absolutely not convinced"). As soon as I have compiled the results I'll pass them on to you. Meanwhile, in Advanced Greek Reading we translated one of Plato's letters to get a feel for the major differences between Classical and Koine Greek. This essaywas a big help. I think we were all surprised at the low number of participles and the high frequency of future infinitives and verbs in the optative mood. At one point Plato referred to "the young and the not so young [=old]." I liked his tact. 6:59 AM Recent openings in religion include this one at Liberty University (Lynchburg) andthis one at Westminster Seminary (Philadelphia). 6:53 AM Last night my beautiful wife (bedecked in her Ethiopia garb) presented slides and video clips of our work in Africa during the “revival” at Union Chapel Baptist Church. The word “revival” covers a lot of territory. In a very real sense, only God can bring revival. We are afflicted today with a cheap brand of Christianity that will not pay the price for the best. I guess the message I want to share with these wonderful saints is that every one of us must make a choice between the world and the cause of Christ. My exhortation is: Come as you are and trust in and obey Him as best you know how. Tonight we conclude our meetings with a message called “The Teenagers God Uses” based on a forgotten little corner of the Gospel of Luke. 6:50 AM Here’s a happy surprise. I had breakfast yesterday with my good friend Timothy Grubbs of Broadman and Holman and we talked in detail about the revision of my grammarLearn to Read New Testament Greek. We talked about setting up a website for teachers where they can download exams and quizzes and a page for students where they can access additional exercises (with an answer key) and audio files. As anyone who has written a textbook can attest, having a book go into a third edition is a nice serendipity. I plan to do most of the revising this summer while teaching 6 weeks of beginning Greek. 6:45 AM I had two meetings in my office yesterday with students wanting advice about Ph.D. programs. I love to chat with scholars-in-the-making about my experience and offer any suggestions I can, but one of the most important things I emphasize is the difference between full-time academic work and full-time pastoral ministry. There are many parallels between them but they are, in my opinion, two different callings. An academic Ph.D. may mean a Phenomenal Dud unless there is divine leading and illumination, so we had better be sensitive from the outset to the leading of the Holy Spirit in terms of our life’s work. And, if the Lord has indeed called us to a lifetime of academic work, our doctoral dissertation will be the least important book we ever write. It will be (or at least should be) the foundation on which a lifetime of research and writing will be built. So we chatted about the differences between a university Ph.D. and a seminary Ph.D. and the primary importance one should attach to one’s mentor. After all, Christian education is essentially likeness education (as Jesus taught in Luke 6:40). So be careful whom you choose as your Ph.D. advisor – chances are you’ll become just like him or her! I don't remember how I first came upon your website, but I have enjoyed very much your essays about the church…. I often find myself thinking that brilliant men and women don't need to be complimented or thanked or encouraged, but whether you need it or not, I need to express my appreciation for how God is working through you. So. Thank you for your faithfulness to use your holy discernment to educate and strengthen the church (i.e. believers). Thank you for encouraging me and challenging me to speak up when I see my church departing from scriptural practices. Thank you for doing what God calls you to do. Faith in action is always a blessing and an encouragement. A dear friend of mine reminded me recently that a man can be regenerated only once but “renewed” many times. He was right. Just as a piano needs to be retuned, just as a timepiece needs to be reset, so our wayward hearts need to turn back from the detours they so easily dog us and come back to the more perfect way of obedience. I have drawn courage and comfort from so many of you through these years of blogging, and I am glad to know that some of you have been challenged in the same way through our website. The Christian’s glory is in Christ’s shame – the reproach of the old rugged cross – and I am glad to bear that cross with you. May God and God alone be glorified. 6:11 AM Edelweiss's baby is a two-toned cutie. 6:08 AM The joys of missionary living. 6:05 AM Who said it? All men are created equal. They are endowed by their Creator with certain unalienable rights; among these are Life, Liberty and the Pursuit of Happiness. This immortal statement was made in the Declaration of Independence of the United States in 1776. Answer: Communist leader Ho Chi Minh. The date: September 1945. He was reading the “Declaration of Independence of the Democratic Republic of Vietnam.” U.S. army officers shared the review stand while a Vietnamese band played “The Star-Spangled Banner.” Later, American warplanes flew in salute over the city. In the best of circumstances, regime change most often goes astray owing to unintended consequences, popular resistance, and the almost-inevitable tension between the installed regime and the regime-makers. In a foreign and complex culture, forced regime change seems to be a formula for disaster no matter what the underlying intentions. 6:41 AM The difference a sausage can make. 6:36 AM Unbelievable. I just found a version of Wikipedia in Alemannisch. 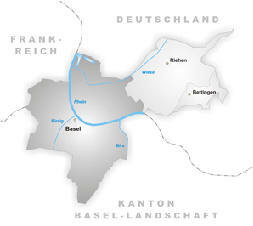 I could have really used this when I lived in Basel. 6:32 AM I will never forget my first view of the famous Parthenon in Athens. Little did I realize at the time that the original Parthenon sculptures were red, green, and blue. 6:29 AM One of my all-time favorite authors, J. Gresham Machen, offers a brief but inspiringintroduction to New Testament Greek. 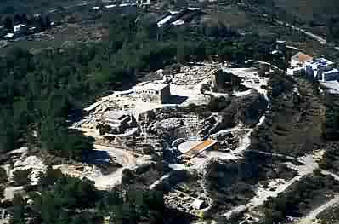 6:25 AM Sepphoris remains one of the most important yet unappreciated archeological finds in New Testament studies. For one thing, Jesus the builder (Gk. tekton) would have spent time there rebuilding the city. If I could return to Israel and participate in the excavation of any one city, I think Sepphoris, "the ornament of all Galilee" (Josephus), would be my choice. 6:21 AM How well is your favorite Bible translation selling? 6:18 AM The last few days have been eventful to say the least. On Saturday we had a wonderful visit from Dennis and Polly Riddell and their 7 children. We enjoyed a tour of the farm, chess, fishing, and lunch and supper together. We met the Riddells at a reenactment last year. Their 3 daughters share our love for horses and are very involved with 4H. Meanwhile, our revival at Union Chapel Baptist Church got off to a great start yesterday. I heard from many members of the Body that they want to become more intentional in the use of their spiritual gifts. I know, for me, it took a long time before I went from a "serve us" mindset to a service mentality. I also enjoyed seeing our area churches working together. Last night the Averett choir joined hands with the Union Chapel choir and the result was thrilling, I must say. The believers in our area are wonderful people -- kind, generous, very down-to-earth, and passionate about their community. I hope we will see the day when all of us are exercising our gifts and abilities to the maximum for the Lord. 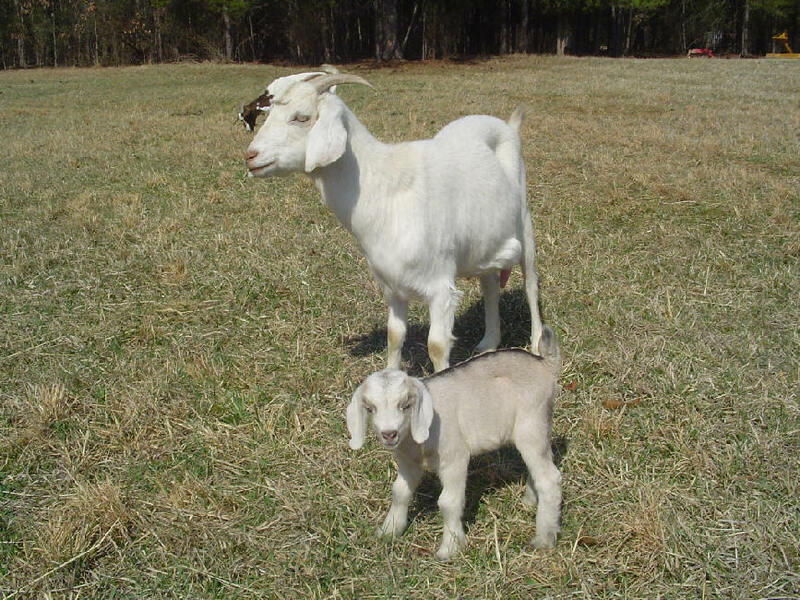 1) Edelweiss gave birth on Saturday. The Riddells were here to watch the miracle. 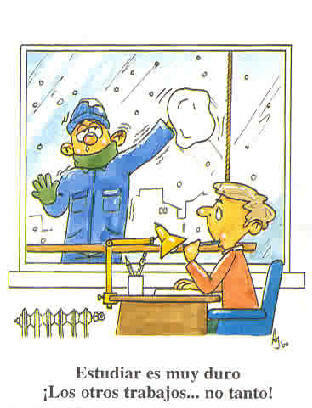 2) It seems we have gone directly from winter to summer around here. What ever happened to spring? They're predicting temperatures in the low 90s today. 3) We'll continue our fencing project today, having taking Friday and Saturday off. On Friday I was too worn out to do any physical work and Becky warned me that if I didn't rest up my tiredness could easily turn into illness. I lazed about all day and read and listened to Mendelssohn's Elijah in German. 4) Yesterday I began having a "layperson" read my Scripture text for me before I begin speaking. This went over well and is a good way of involving others. I think I'll make it a habit. 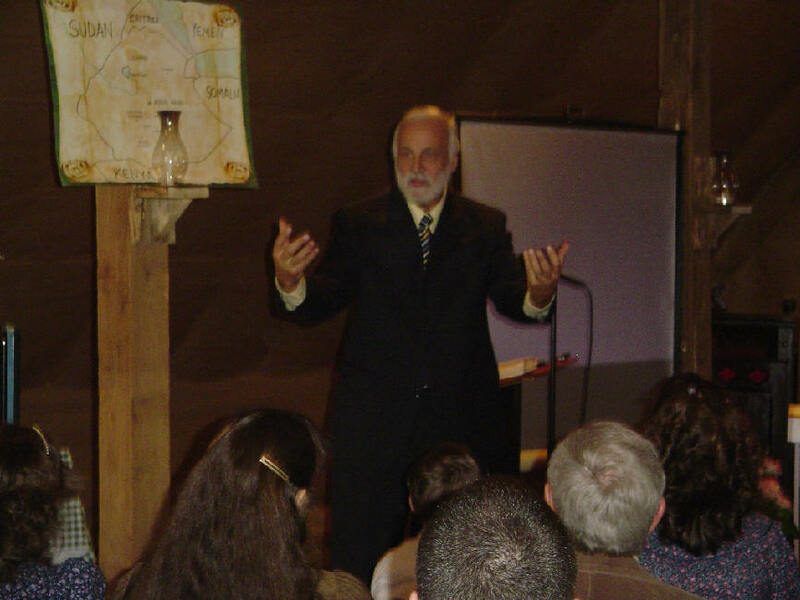 Another habit of mine is to speak from the floor instead of behind a pulpit whenever possible. 5) Over lunch and supper at the meeting house I learned tons of things from the older saints about the history of this area. I need to tap into this marvelous resource while I have still the opportunity. How are you? I am fine. I never forget the moments in Addis Ababa with you, with my brothers and with my sister. When we eat together Papa B gave a sit for me and for my brother Samuel beside Mama B. This shows me how Papa B loves me and Samuel. 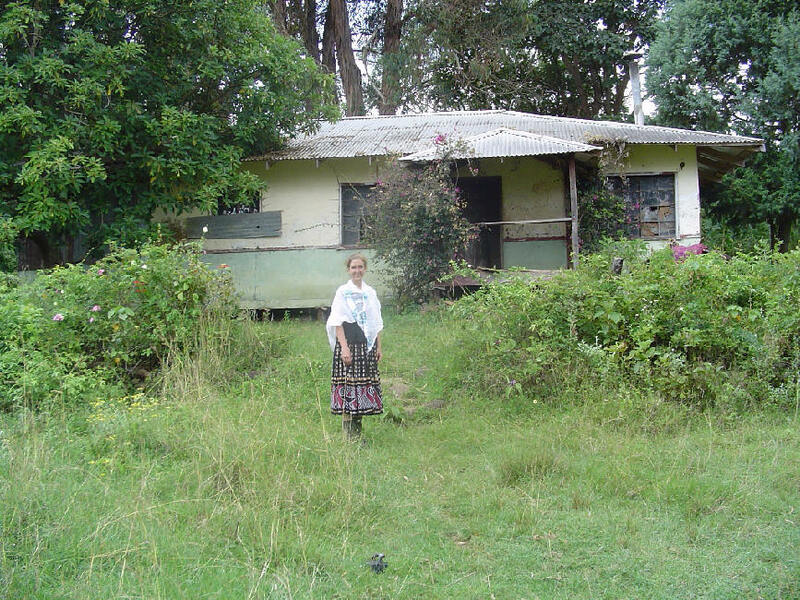 When I went to Gondar my sister Ashageru picked me to our home. Then my friends, relatives, families and neighbors came to visit me. For all people the things that God is doing through you for me is miracle for three weeks many people visited me with milk and fruits. Everybody asks me about you and Samuel my answer is they are Gods people so God is doing miraculous things to me through them. Ashageru is very happy with gifts and she teaching me properly. I invited my friends to read the Bible and other books. They very happy and they want to have their own Bible to read. Every thing you planed to me is arranged except the cow. The total expense for those materials is 1484birr. No one has things that I have and everybody asks me and my answer is JESUS through Mama B and Papa B. I am witnessing about Jesus for every one. Many people are waiting for Samuel eagerly in the next summer. Papa B and Mama B your good work made many peoples heart is open for gospel. Me and Samuel will have great ministry. So please pray for our Evangelism program. I love you so so so much! Please give my love to Nathan. 6:36 AM If you play a brass instrument and are interested in serving the Lord overseas this summer, here's a good option for you to consider: Eurobrass. 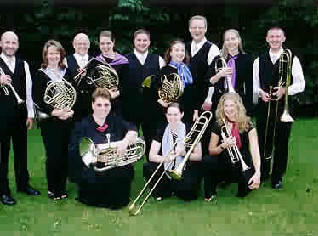 I spent the summer of 1978 playing trumpet on this team (it was called Eurocorps back then). It was while preparing to travel with this group that I taught myself German, which later opened the door for me to study in German-speaking Switzerland. If you do not feel led to get involved with this opportunity, why not consider another short term mission project? 6:30 AM The BBC is reporting on the dangers of air travel, including the increased risk of developing blood clots. People sometimes ask me if I enjoy flying. I used to. Now it's a necessary evil. My long legs don't help at all. Thankfully, our flights to Ethiopia allow us a layover in Frankfurt. I don't know how I ever managed those 14-hour flights to Korea when I lived in California. 6:23 AM On this day in 1818 the novel Frankenstein was published. Did you know that Mary Shelley's famous tale is based on Prometheus, a character from Greek mythology? 7:30 AM No update yet on Bereket's meeting with his eye doctor. When I hear something I'll pass it on. 7:10 AM Last night Becky wrote thank-you notes to those who recently contributed to the needs of the Ethiopian churches. The latest contribution was a crumpled-up one dollar bill from a two-year old. He too will get his letter of appreciation in the mail. 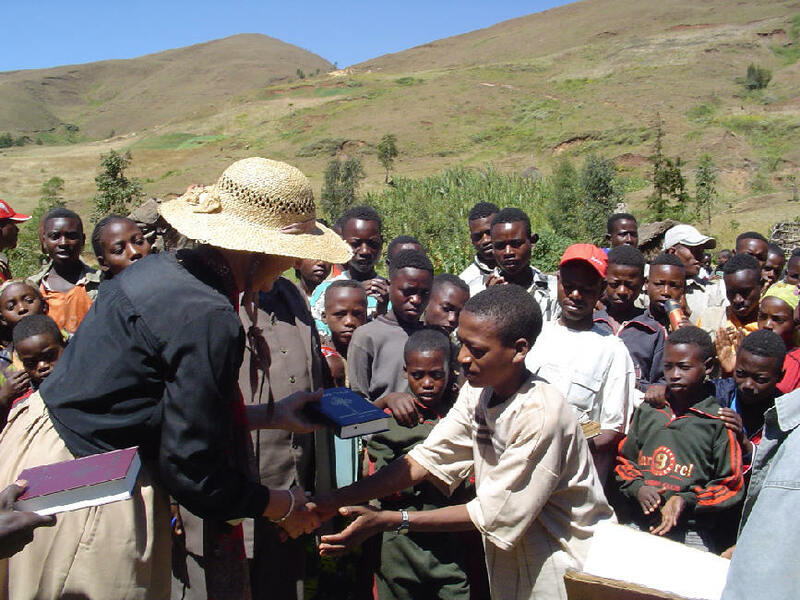 There are no "small" gifts: his one dollar amounts to one-fourth of the cost of a Bible for an Ethiopian child. Meanwhile, it's time to continue our fencing, though we'll need to make a trip to South Boston sometime today for more wire mesh. I feel we're in the home stretch of the project. Finishing the east-west property line is the only major fence to complete before we can put the goats and cattle in the new, larger pasture. Water won't be a problem: there's a live creek plus the new trough we installed on Wednesday. I am dog tired, but events like yesterday's double birth makes farm work worthwhile and rewarding. I feel like shouting Hallelujah. The evangelical complaint has to do with the rejecting nearly two millennia of Christian tradition and teaching in favor of a revisionistic contemporary reading. In the final analysis, conservative Christians are simply pleading with their friends on the left: "let the Scripture speak!" 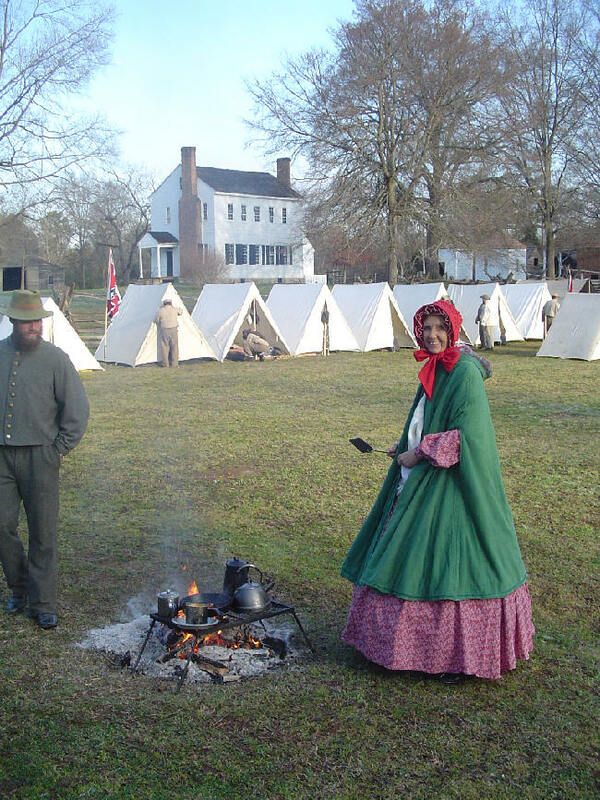 6:45 AM Join us, if you can, on March 25-26 for the Latta Plantation Civil War Reenactment near Charlotte, NC. On Sunday I will be preaching at the period chapel service. For more information and directions, click here. 6:10 PM Today we put up 660 feet of woven wire. That ties a farm record. The Lord gave us perfect weather. Lobe den Herrn. 6:08 PM All of Rosewood Farm would like to say "Happy Birthday" to Daisy's twins who were born this morning. 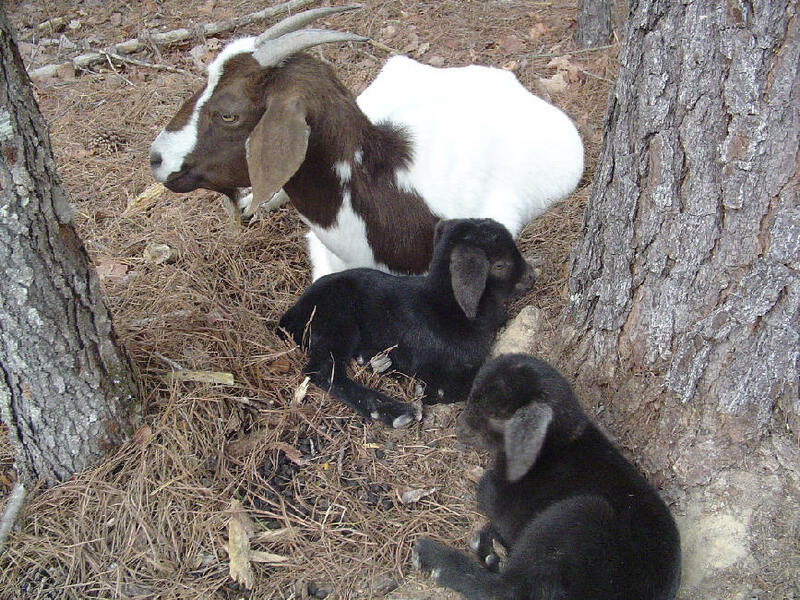 I've never seen baby goats that looked more like newborn puppies. What else can you say but "Awesome"? 1:15 PM Just back from the far reaches of the farm for a bite to eat. I spent the morning stumbling over tree stumps, tripping over briar bushes, hauling 200 lb. rolls of wire mesh uphill, and otherwise being the klutz I am. 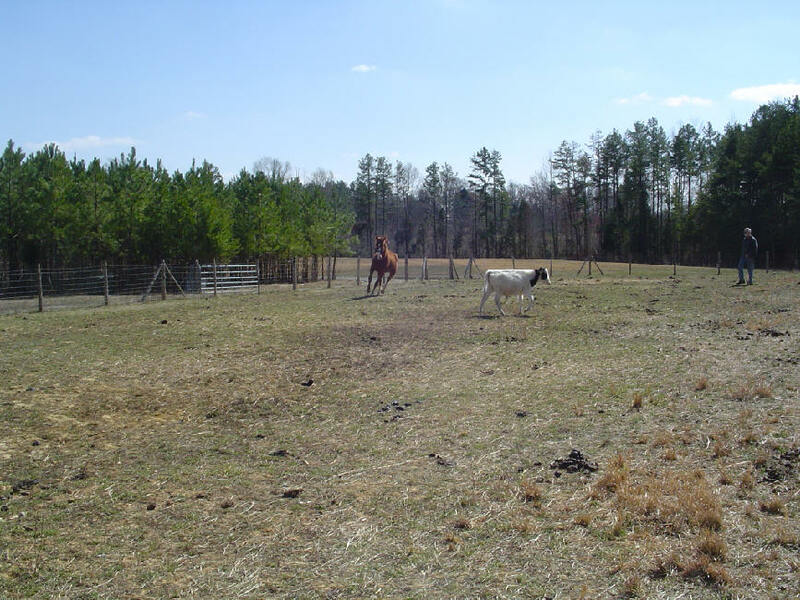 The good news: We have finished fencing in the entire back line of our property. Can you believe it? Blow a trumpet in Zion! 7:10 AM The Highland Theological College in Dingwall, Scotland is seeking a lecturer in pastoral theology (.pdf). On our first visit to Greece my wife and I were walking along a country track in Rhodes early one morning when we encountered an elderly local woman.Kalimera she said. Without hesitation, my wife replied kalamari. Surprised at the strange expression on the Greek woman's face my wife asked me what was wrong. 'You've just called her a squid', I replied. One of my most embarrassing moments came when ordering for Becky and me a pepperoni pizza in Germany. The waiter brought us a pizza -- covered with red peppers. Being more kind and understanding to us than we deserved, he promptly brought us a pizza with sausage. 6:37 AM The best blogging newspapers. 6:35 AM Ethiopia's Population Expected to Grow by More Than 100 Percent by 2050. 6:29 AM Here's an interesting essay on a "former born-again Christian" who teaches at the University of North Carolina. As my friend Darrell Bock says in the conclusion, the same evidence that strengthens the faith of one person can destroy the faith of another. How often people would say to me, "Don't go to Basel for your doctorate -- you'll lose your faith." That was very sound advice indeed for anyone who was uncertain about his or her beliefs. I found my Basel experience highly conducive to genuine "liberal" scholarship -- that is, scholarship based on an open mind and a readiness to explore the evidence. At any rate, I can certainly understand how one's faith can be destroyed through exposure to higher-critical methodologies, even though those methodologies need not be inherently anti-supernatural. Along these lines, the recent essay by Nathaniel Simmons called The Bible Is Fact is well worth reading. 6:25 AM I see that Logos Bible Software is set to publish A. T. Robertson's classic A Grammar of the Greek New Testament in the Light of Historical Research. Kudos to them. Several years ago Broadman & Holman asked me if I would consider revising this massive work. I thought and prayed about it, but I concluded that the book should be left as is. In its time, it was the best grammar of the Greek New Testament available, and is still unsurpassed in terms of historical-comparative linguistics. Anyone who tried to revise it would end up rewriting it, just as Robertson began by revising Winer's grammar and ended up writing his own. 6:20 AM It's another spring-like day here in Southside Virginia. On our agenda: more fencing, just as long as the Lord holds off the rain. If it does, I plan to get some research done. This Sunday I'm starting a series called "Body Building" that will focus on growing our churches to be healthy and biblically sound. I'm drawing great encouragement from the Book of Acts -- the story of how a few Galilean peasants turned the world upside down in a mere 30 years. I'm glad to be a small part of what God is doing to raise up loving, godly congregations in this part of the Bible Belt. 6:17 AM Yesterday we had a delightful time with Matt and Liz Rondeau and their boys Caleb and Isaac. Liz helped Becky can blueberry-apple and strawberry jam. 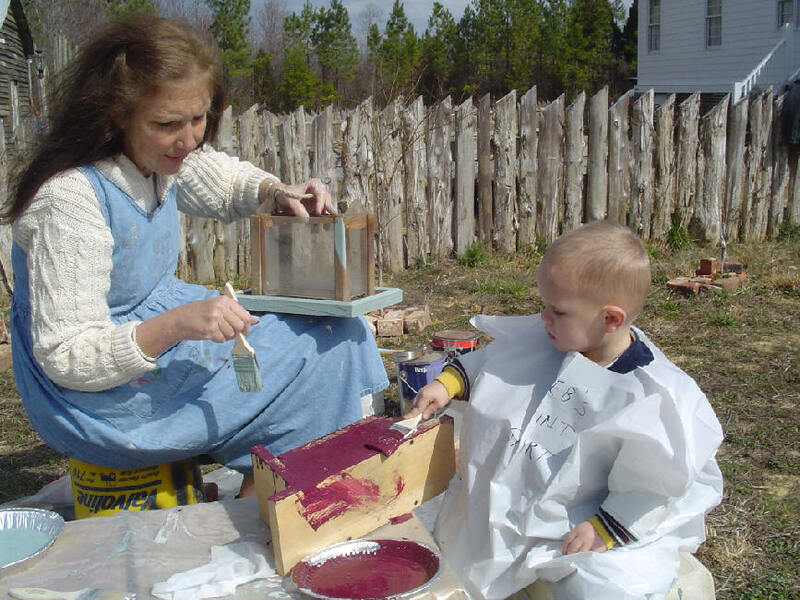 Caleb's special project was painting our new bird houses, and a marvelous job he did. 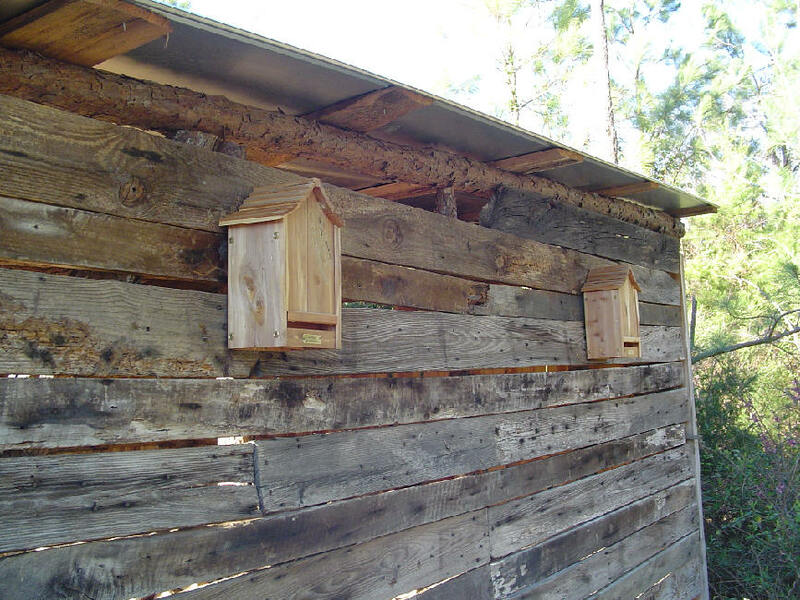 We hope he stops by often to visit "his" birdhouses to see how they and their inhabitants are doing. Matt is quite the culinary expert and taught us how to roast the coffee we brought back with us from Ethiopia. It tasted great. 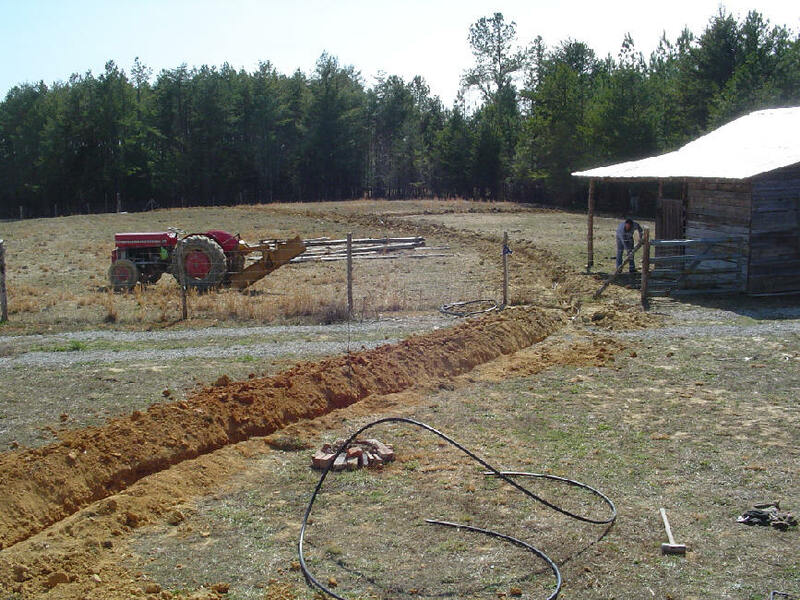 We took a break from fencing to put in water lines to spigots at three different pastures on the farm. Matt (and Caleb) helped us dig the ditches. We actually finished the project and filled in the ditches just before dark, arriving at what my wife likes to call a "cycle of completion." It felt good. The curious kittens came from all over the farm to investigate what we were doing in their pasture. Thank you, Matt and Liz, for taking time out of your busy schedules to help us with these projects. 7:36 AM Just noticed that Wikipedia lists our Unleashing the Church page as a resource in their entry on the house church. 7:33 AM Bereket sees his eye doctor today. 7:30 AM Here's an interesting state-by-state analysis of the impact if Roe is overturned. 7:28 AM I see that even the Pope has an iPod. I don't even know what an iPod is. Shows you how up to date I am. By the way, I do know what a cell phone is. I just choose not to have one. 7:23 AM Chuck Baldwin recently did an interview on Romans 13. To listen to it, click here. Note: Romans 13 must be read in light of its context if it is to be understood correctly. 7:20 AM I'm still sore from yesterday. We put up more fencing and did more clearing with the chain saw. We keep wondering, "Will we ever finish?" Then my mind went to that corny scene in one of the Three Stooges movies when they say, "Niagara Falls, slowly we turned, step by step, inch by inch...." I mentioned this to Nate and we both had a good laugh. It's funny but true -- projects get done step by step and, at least in our case, inch by inch. I predict we will finish by mid-summer, Lord willing. If you are working on something similar at your farm, let me know. I'd be happy to mention it on this weblog. 9:18 AM Rick Saenz of Cumberland Books has published his interviews with us about our attempt to pursue a more agrarian lifestyle. For a sound clip, just click on the images below. 9:12 AM A student sent along this email. I reprint it in its entirety (with the author's permission). So as not to be misunderstood (me being a student in one of your classes this year), I have hesitated for quite some time to mention to you how much God has used you in deepening my love for Him and His Word. Yet I cannot stay silent any longer, for I am exploding with excitement and worship to God. The straw that broke the camel's back was reading one of the latest articles about the church you posted on your website (which I frequently visit and often recommend). Every day my mind is flooded with more questions about the church, but I am beginning to gain more biblical understanding for something that for quite some time has been fuzzy and confused in my mind. The closest thing I could "nail down" was that I identified with a lot of what the emergent church folks have been saying/writing about the essence of the church, getting back to the core of being a follower of Jesus, cutting out the fat, living a life of authenticity, etc. I still wish they would offer a stronger commitment to the authority of God's Word and tone down the cynicism (though I confess I have to fight it, too), but I guess as a large and spread out movement its distinctives can be difficult to pinpoint. Anyways, toward the end of my college years, and especially the year or two following as a church "staff" person, I started to compare what I read in the NT to the "methods" and practice of the average American church. I started wondering why I was a "youth minister," why 2/3 of our church budget went to building funds and staff salaries, why I was so weary of the constant "pat-yourself-on-the-back" planning meetings, programs, and "outreach" events. Why call 11:00 Sunday "worship?" Why say we "go to" church? Why is missions treated as for the elite only? Why is everyone biblically illiterate? Why don't parents take responsibility to raise godly children? I was tired of compartmentalized Sunday-only Christianity, top-down pastor-centered leadership, lecture-style format, logos, slogans, mission statements, the latest "methods," promotions, membership classes, rosters, mail-outs, and addiction to numbers that betray a corporate mind-set. I longed an escape from Christian "club" and pseudo-discipleship. Why not open our homes and our hearts to each other? Why not really pray together? Why share communion so rarely? Why keep the kids out? Why not work "regular" jobs and use the money to support the body, the poor, the widowed, our neighbors, and missions? I longed to be mentored and taught by an older man/men in the church (I asked our pastor, and then a deacon- we didn't have elders, hmmmm- but neither seemed to have the time, interest, or perhaps, ability). In fact, a main reason I resisted going to seminary was that I felt that I should be taught by the church. I wondered if God preferred to use me in ministry outside of "professional Christianity" and spent the next three years floating around as a high school teacher/coach and a sales rep. Finally my wife and I decided that whatever passion God had given us needed to be fine-tuned, focused, and informed so we moved to seminary (sort of like a guy who longs to help people physically, but that passion must be matched with knowledge at medical school). I wanted to avoid having knowledge without passion, but realized that passion without knowledge can be just as harmful. It does seem the church is at a crossroads and I am very excited about what God is doing. He has confirmed though His Word and now through you that just because I am not comfortable with the current state of the American church (and I'm afraid we're "selling" it out overseas) I am neither crazy, nor a "bad" Christian. It is precisely because I love Jesus that I want His Church to be an accurate, and therefore honoring, picture of Him. I am sorry for the long email- but I feel like I am tapping with my spade on the top of a vast treasure! I know you are very busy, but thought I'd let you know how grateful to God T. and I are for you and Mrs. Black- for your lives and for your ministry. 12:32 PM Almost forgot: Bereket arrives in Addis today for his eye checkup. If everything goes well, he should be able to be fitted with reading glasses this summer. 12:24 PM Right now I am buried under a pile of emails. We spent the weekend in Rocky Mount, VA, and had a blast renewing fellowship with some dear friends we hadn't seen in over a year. Our drive there took us on the old roads that snake their way through Southside Virginia, and we were treated to views of a good number of ante-bellum houses. We arrived and had lunch with Greg Enquist and his family, in whose barn Grace Bible Church meets. The Enquists have 9 wonderful children. Then we spent the night with Don and Karen Meggs and their 8 children. There we were treated to several piano and vocal recitals -- when we weren't roughhousing or drawing with the kids, that is. On Sunday morning I taught on "Jesus' Philosophy of Missions" from Matthew 9 and Becky shared our pix of Ethiopia. A fellowship meal and the Lord's Supper followed. 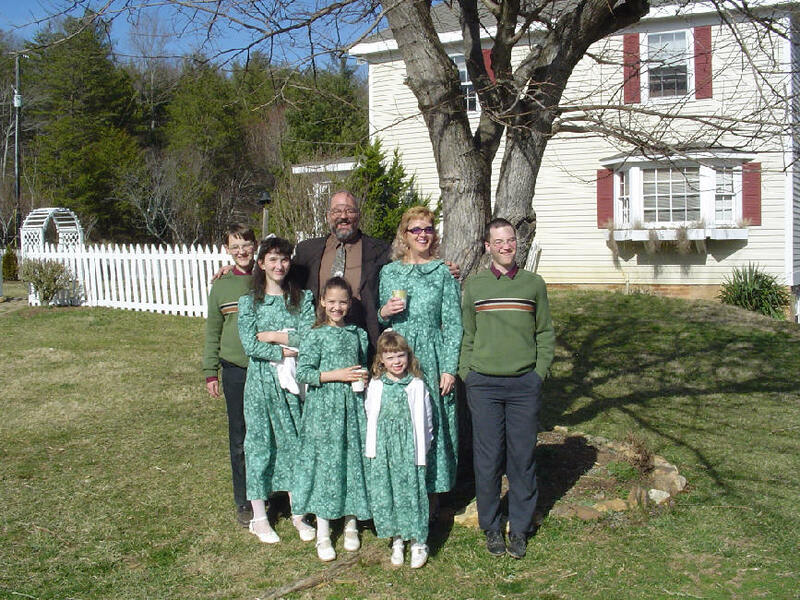 Nice serendipity: the John and Julie Austin family traveled 3 hours from Abingdon, VA to be with us at the barn church. This is yet another incredibly talented family, including their eldest son Joshua (right), who is taking Greek with me by correspondence. Joshua even had his Greek New Testament open as I taught from mine during the edification service. I am relieved to report that he thought I did a pretty good job with the text. I want to thank Greg Enquist for inviting us to come and speak and the Meggs for their wonderful hospitality. Becky Lynn and I have some great homeschooling friends that we don't fellowship with often enough, so it is always a joy to be reunited, if ever so briefly. Being with all those talented and active youth sure keeps one young! Meanwhile, it's too wet, and we're too tired, to get any farm work done today. Looks like I'll be spending most of my time preparing for my series of messages that begins this Sunday at Union Chapel Baptist Church. 6:48 AM Last night I finished reading At Dawn We Slept, the story of the Japanese attack on Oahu. The book has only a few pictures of the raid, but there are several websites with complete archives, including this one. 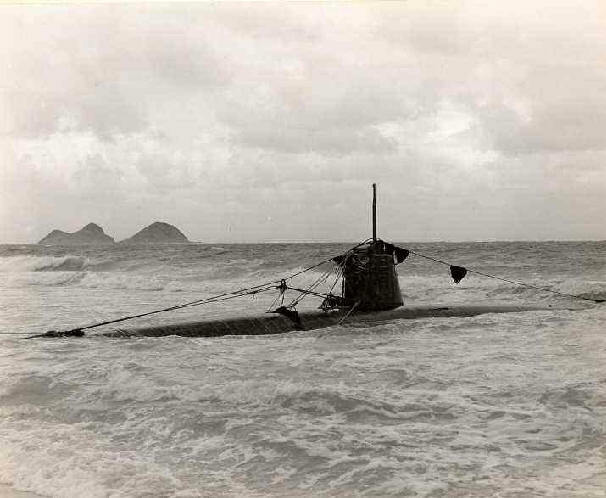 The photo below shows a Japanese midget submarine that ran aground during the attack in a place I've surfed hundreds of time -- Waimanalo Beach. In the background are the Mokulua ("Twin") Islands located about a mile offshore of Kailua Bay where I was raised. Here we would surf a fantastic reef break. Just to the north of where this photo was taken is the Kaneohe Marine Corps Air Station, which was destroyed during the attack. Seems odd -- growing up in what was once a war zone. 6:40 AM Miscellaneous farm news and notes. This week Nathan painted the new barn roof. We've got five more outbuildings to go. We'll eventually use the same color for the roof of Bradford Hall. 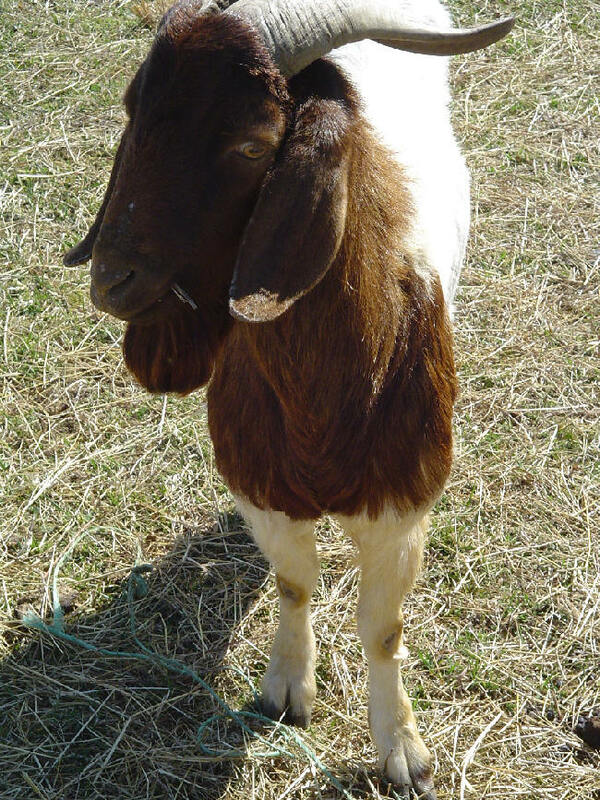 We've named our new billy. We call him Pharaoh. Yesterday I went to ride Trav but he needed an airing out instead. It was a combination of the atmosphere, the howling wind, and lack of exercise. So I made him run and run. He enjoyed it, and so did I. I've ridden Trav I'd guess about 2,000 times. He's always feisty, but there are days when I know better than to get up on his back. Yesterday was one of those days. Nathan just took delivery of an old reed organ from a family in North Carolina. He's been hired to restore it to perfect working condition. It doesn't play but at least the exterior is in good shape. 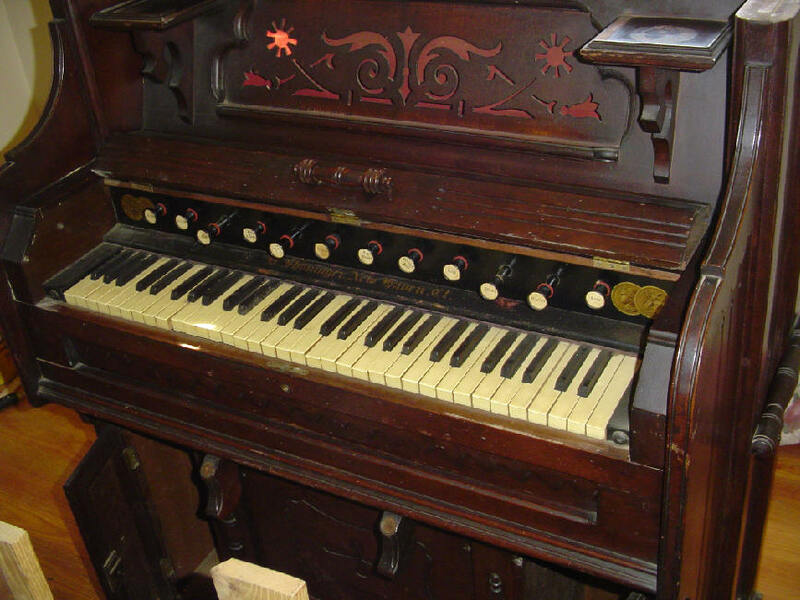 This will be the tenth organ he's restored. Over at Maple Ridge the upstairs bedrooms are taking shape. 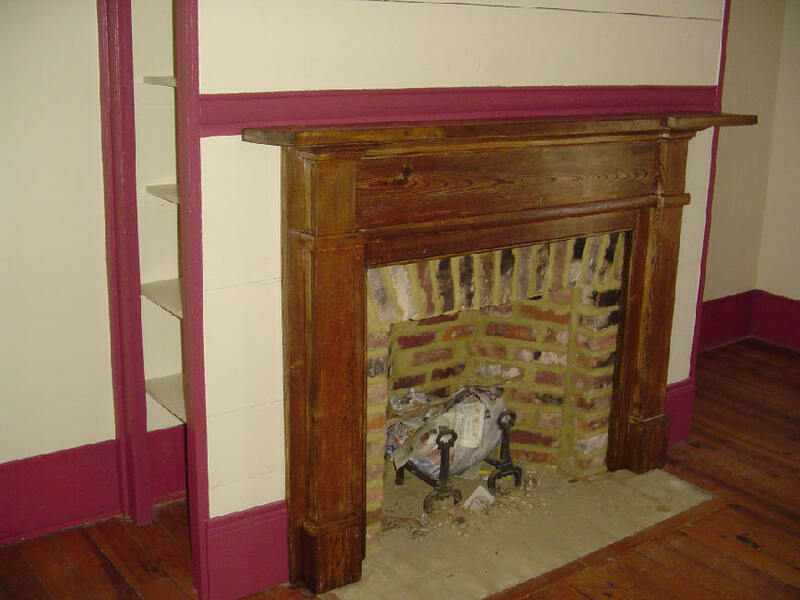 Here's the recently -installed 1840s mantle. 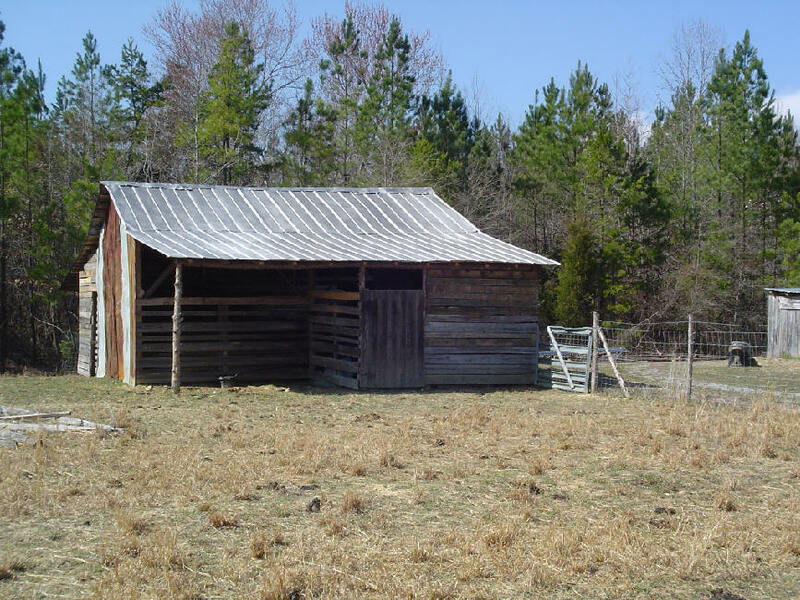 As you can see, at our farm we like an old look with just about everything we build. 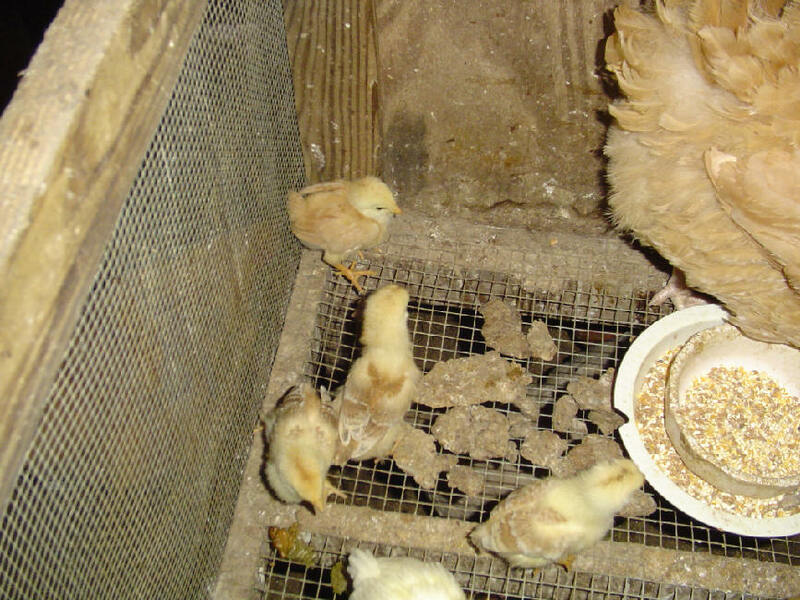 And this is sweet: our chicks have begun hatching out. Here's the first batch of the season. The mama had 7 babies. We've also got our two incubators operating at full throttle. In other news, we're looking forward to a very profitable weekend in Rocky Mount visiting old friends and speaking to some homeschooling families about missions. I'll share from the Word and Becky will present our slides and video clips. We are excited to to be able to renew fellowship with these precious families. In short, God is good. He is moving in wonderful ways in the hearts of His people. We see His hand not only in the Ethiopian church but also in the lives of many of our dearest friends across the country. I believe it was Jim Elliott who gave this bit of good advice: "Wherever you are, be all there, and live to the hilt whatever you are convinced is the will of God for your life." I don't know about you, but nothing brings me more joy than to see people reaffirming their faith in the total sufficiency of Jesus to meet every challenge of life. 12:55 PM For an update on Bro. Rick Saenz's recent visit to Rosewood Farm see his blog, Dry Creek Chronicles. 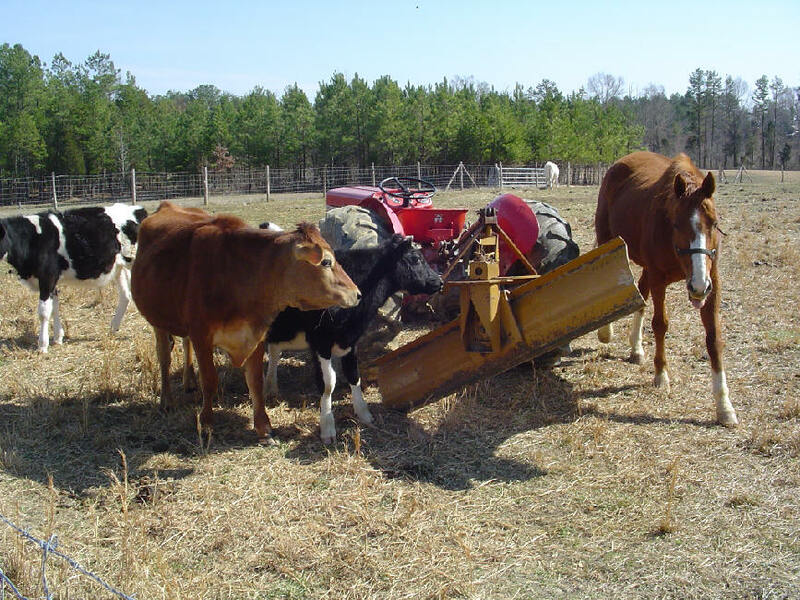 12:47 PM Next week is our semester "break" -- meaning that I'll be working harder than ever here at the farm as we continue the project of the year. The bottom of this picture shows you where we are currently putting up fencing. All of these fields need to be secured before we can turn our cattle and goats out. 8:30 AM Over at Chalcedon we find a highly ponderable study by Christopher Ortiz of the “leadership craze” (my term) within evangelicalism. 8:23 AM Here’s a nice email from a pastor in Texas. I read your articles on the web and am encouraged and challenged by them all. However, I felt the urge to write to you about this one to say, "Thanks!" The church I serve at is indeed a unique one where people serve together and the fellowship is special, but in any church there is always the need to push forward towards a more biblical model. This has challenged me, along with other articles, to be a little more proactive in this particular aspect of recovering the New Testament church here in W., TX. Thank you for your articles. I have just read the latest one and my eyes are filled with tears and my heart grieves. I have spoken in a similar way to my brethren in ministry here in Australia, along the very lines you write. They seem to be living in the past, adoring those, undoubtedly, great men of God who have gone before us, using there writings as if they are the infallible word. The great men of God of yesterday have given us so much as they faithfully fulfilled their ministries, and I thank God for them, but we need great men of God today, who will not be intimidated by the status quo, nor their peers. Your web site is a great encouragement to me and to those with whom I share your writings. 8:10 AM This is a good if somewhat intimidating article on impersonating Robert E. Lee. 6:20 AM A Texas-sized shout out to our friends in the Lone Star State on their Independence Day. My wife is a fifth generation Texan. Her great-great grandfather, J. S. O. Brooks, arrived in East Texas in 1858 and founded Brooks Saline, the largest supplier of salt to the Trans-Mississippi Confederacy. His son William Bradford Brooks served in the Confederate Army as a private with the First Texas Heavy Artillery guarding Galveston. We have a letter he wrote from the front in 1863. After the war he went to medical college and established a practice in Fort Worth. He launched the first medical journal in the state of Texas and had the city's first telephone, which ran from his store to his home (two blocks). 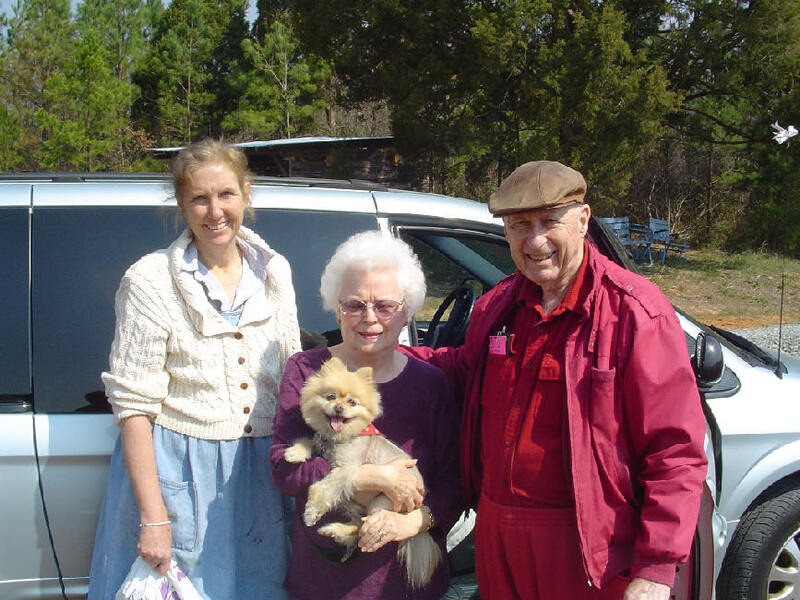 Dr. Brook's last child, Allie Noyes, was Becky Lynn's grandmother. At birth she weighed two and a half pounds and was placed in the oven to keep warm. She taught weekly Bible classes from age 13 to age 102. She lived 104 years. Her favorite verses were Prov. 3:5-6. Her son, Bradford ("Tex") Lapsley, carries on the independent spirit of Texas. Every time the family returned from out of state they would sing "The Eyes of Texas Are Upon You" while crossing the state line. Needless to say, we are mighty humbled by this heritage. 6:14 AM Thursday greetings and thanks to Rick Saenz for sending us yesterday, via snail mail, copies of Family Friendly Farming, Forty Acres and No Mule, Henry and the Great Society, and a CD by the Kruger Brothers titled Choices. Rick's site, Cumberland Books, carries these titles and more. 6:12 AM The latest addition to our home page is called Swimming on Dry Ground. And here's Becky in front of the house her dad built for their family in Gambo. It's empty but still standing. Crawling up the porch posts are the rose bushes Mrs. Lapsley planted 50 years ago. Can't you just see Becky Lynn playing here as a 10 year-old? 6:04 AM We welcome to the farm our new billy (as yet unnamed). He is a pure bred Boer. He cost us our old billy (Rusty), one male kid, and $15.00. 6:00 AM Dr. Henry Morris died Saturday at the age of 87. I had the signal good fortune to be under his tutelage during my sophomore year at Biola College in California. Dr. Morris would drive up from San Diego every Thursday and lecture for 4 hours. He required that I submit to him a 30-page paper on a topic in the field of geology. 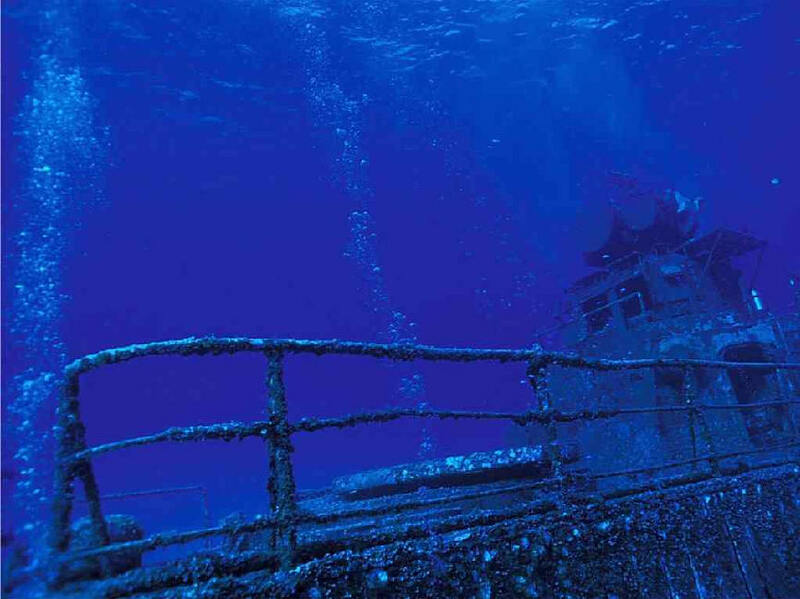 I chose to write on “The Formation of the Hawaiian Archipelago according to the Flood Theory.” Dr. Morris knew that the best way to learn how to write is by writing, and the paper I wrote for him – replete with underwater photos I took myself – was my first serious literary production. If I am grateful to Dr. Morris for contributing to my writing skills, I am doubly grateful to him for enriching my life through his example of humility and kindness. My favorite times during that semester came on Thursday evenings when I sat at the feet of a wise and good man. Eventually my other mentors – Harry Sturz of Biola and Bo Reicke of the University of Basel – provided me with a model, not only of scholarship at its highest level, but even more of character. Each combined the attributes of keen rationality and unashamed piety – the proverbial “clear head” and “warm heart.” Although none is alive today, I feel they are still looking over my shoulder as I write. If we have any doubts whether it is possible in this day and age to be both tough-minded and tender-hearted, we need only look at the lives of men such as Henry Morris.